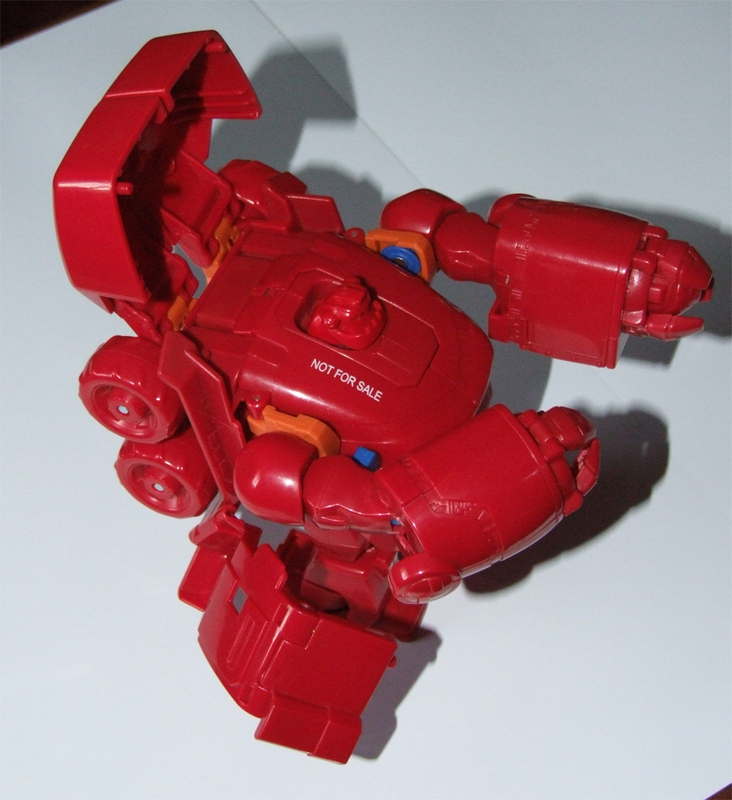 This gallery, created on the 3rd September 2007, contains the first full image gallery and review of any Transformers Animated toy. 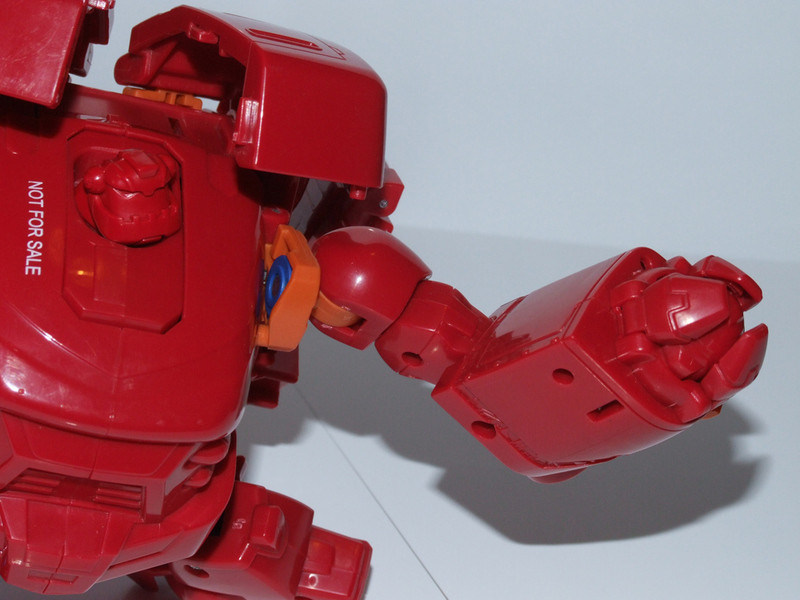 The gallery is of a testshot of Transformers Animated Bulkhead. 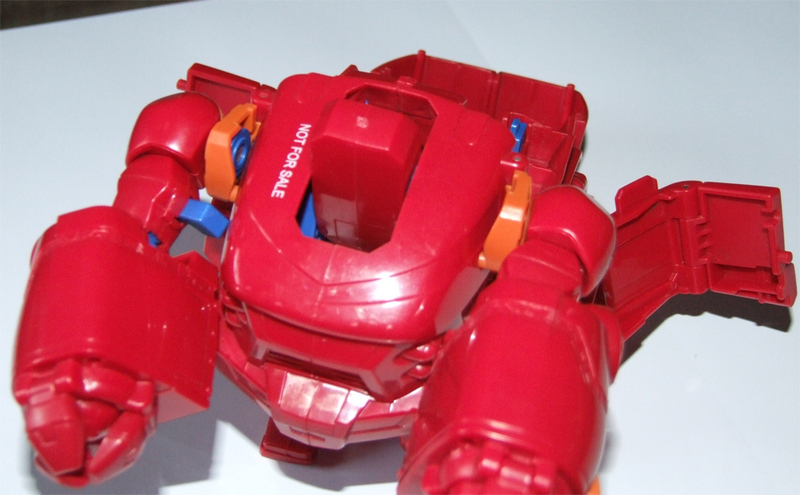 The testshot was made from red, orange and blue plastic. 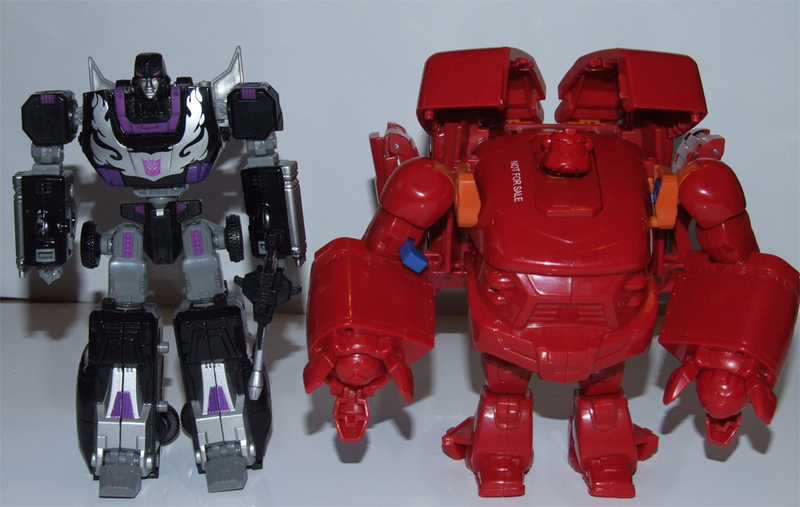 At the time, the Transformers Animated toyline was scheduled for release in early 2008. 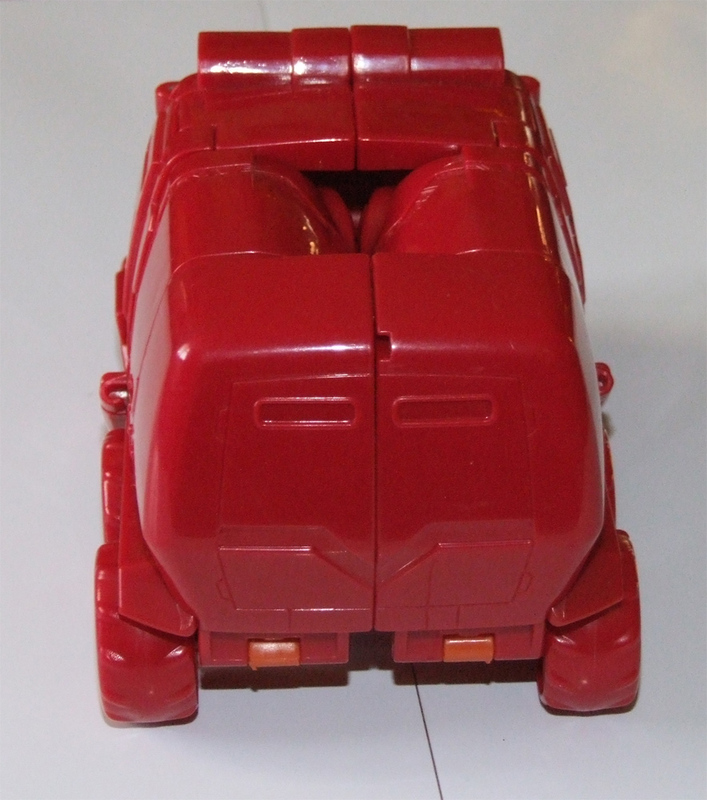 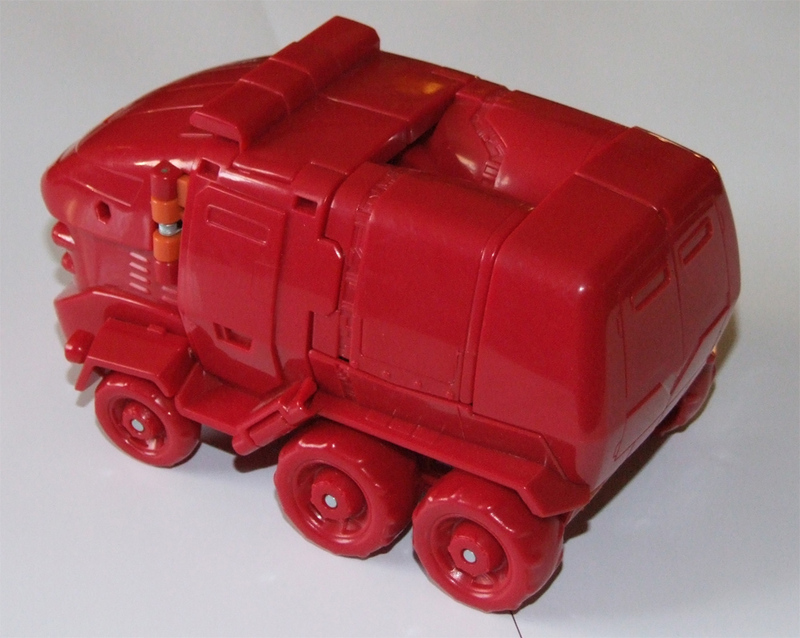 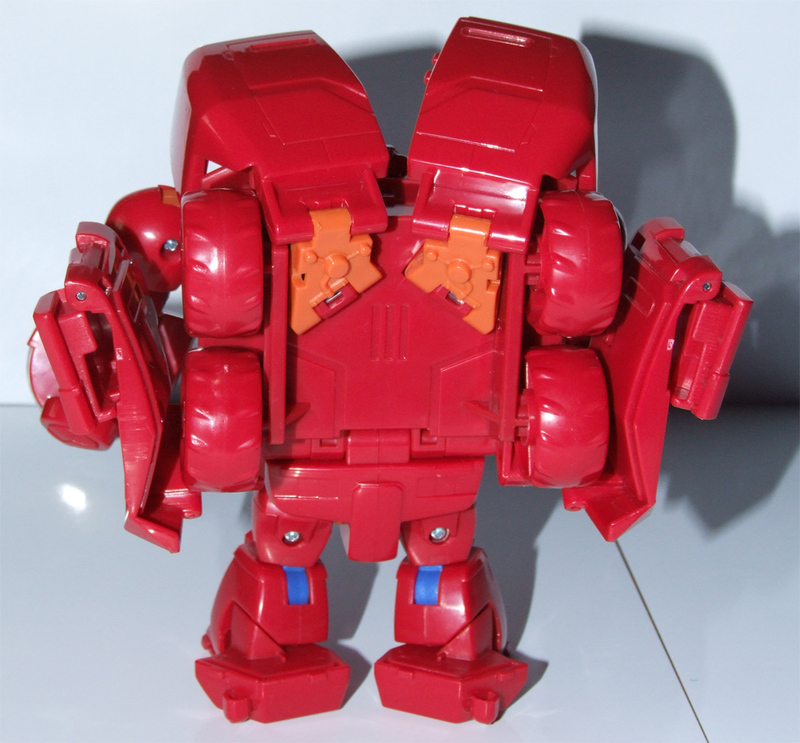 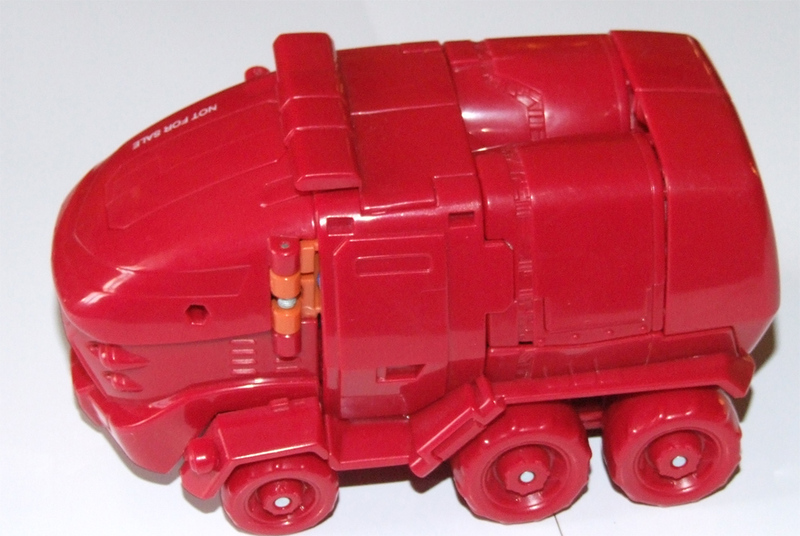 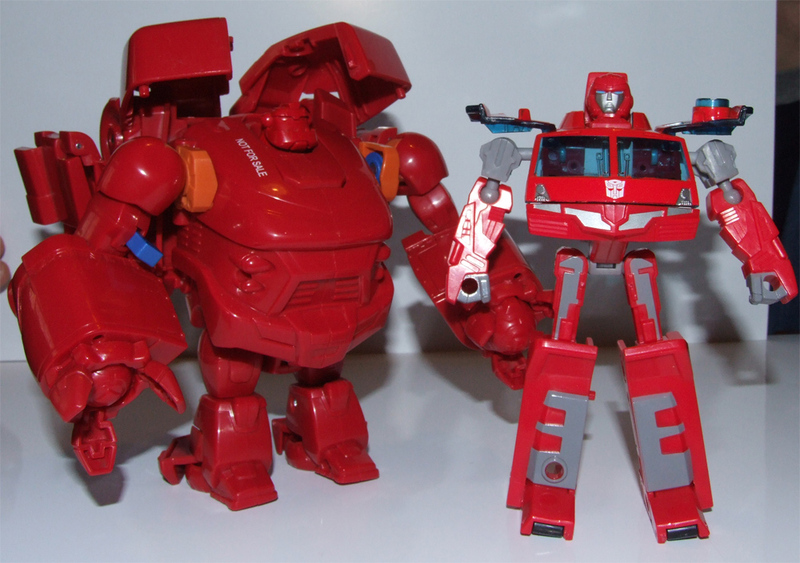 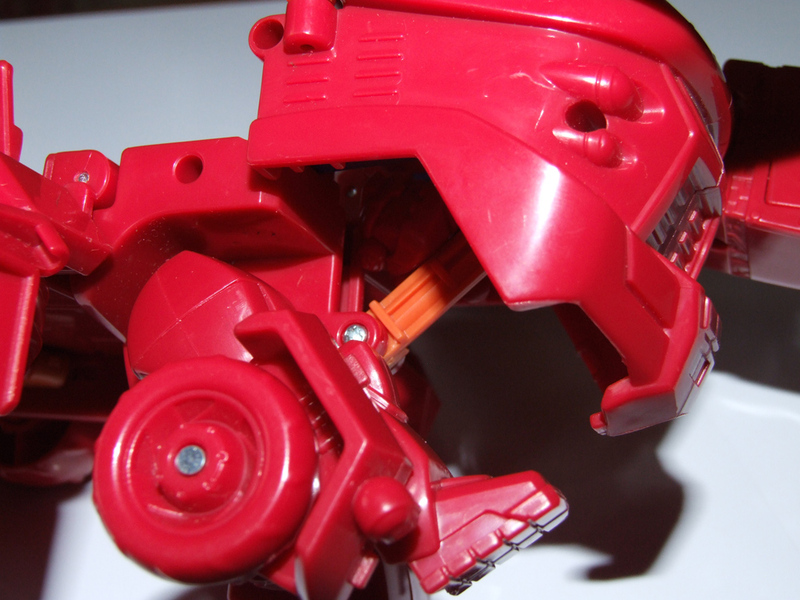 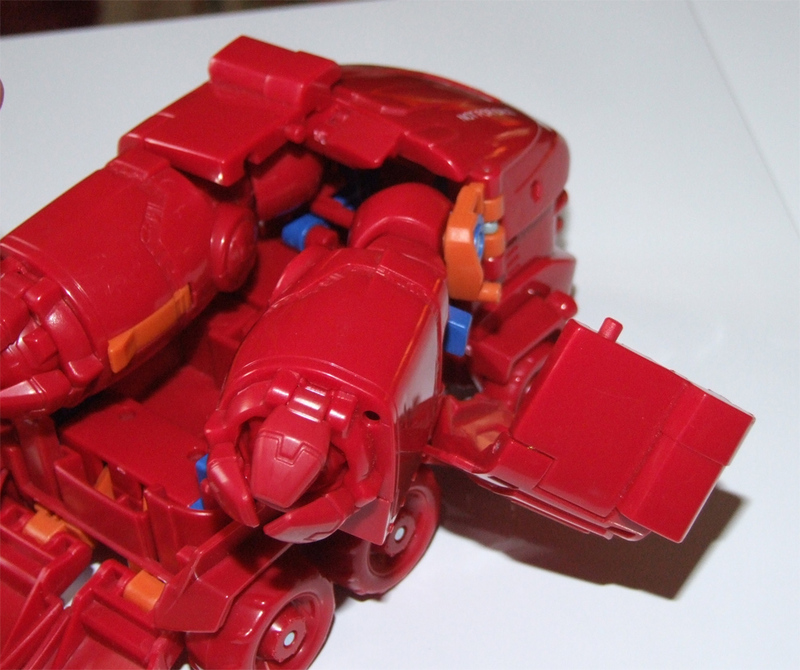 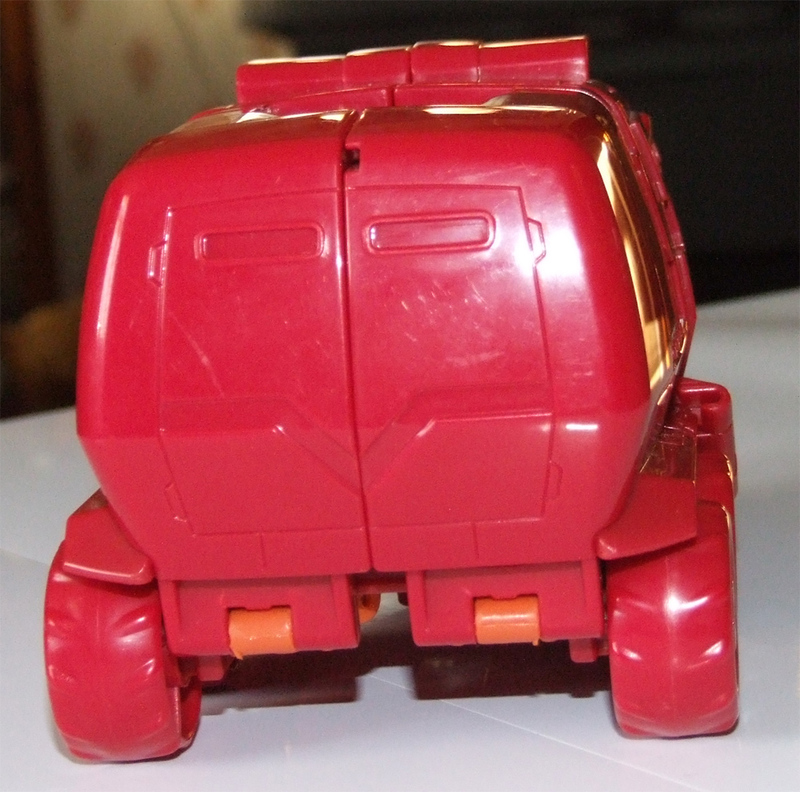 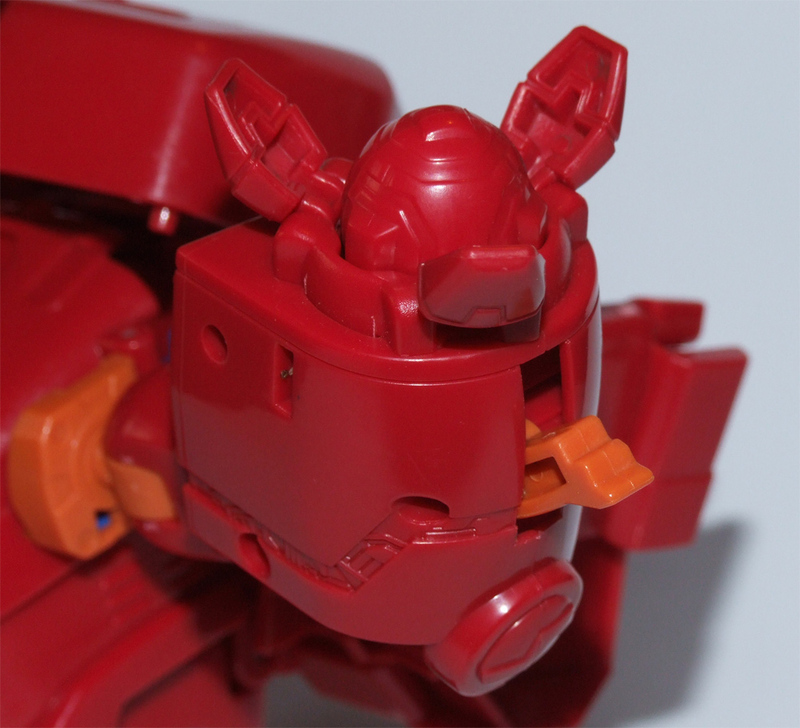 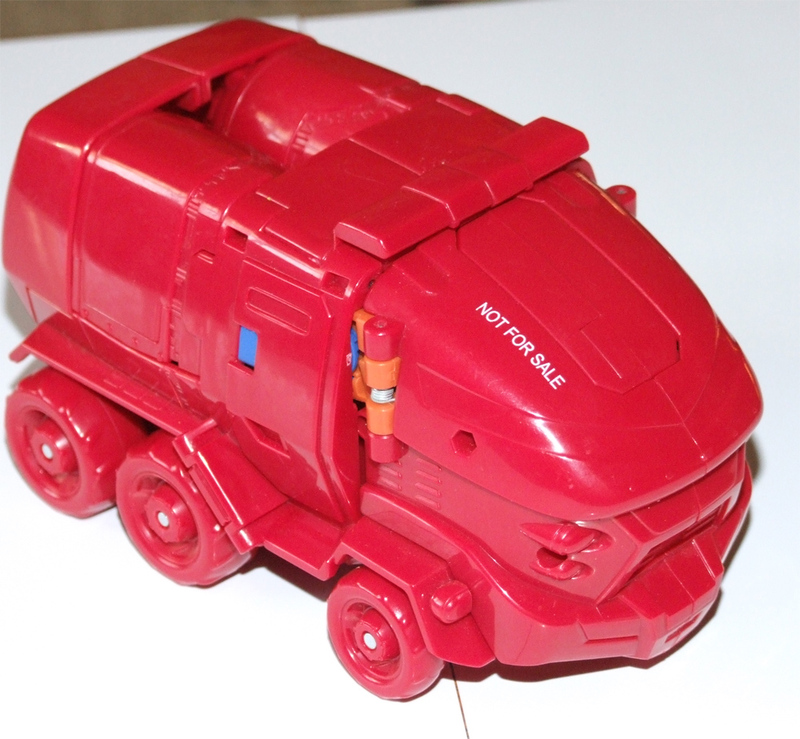 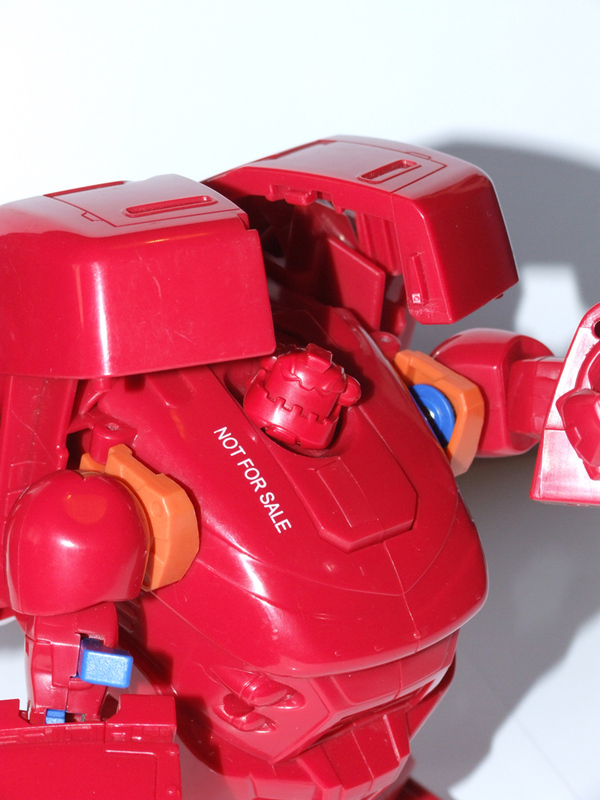 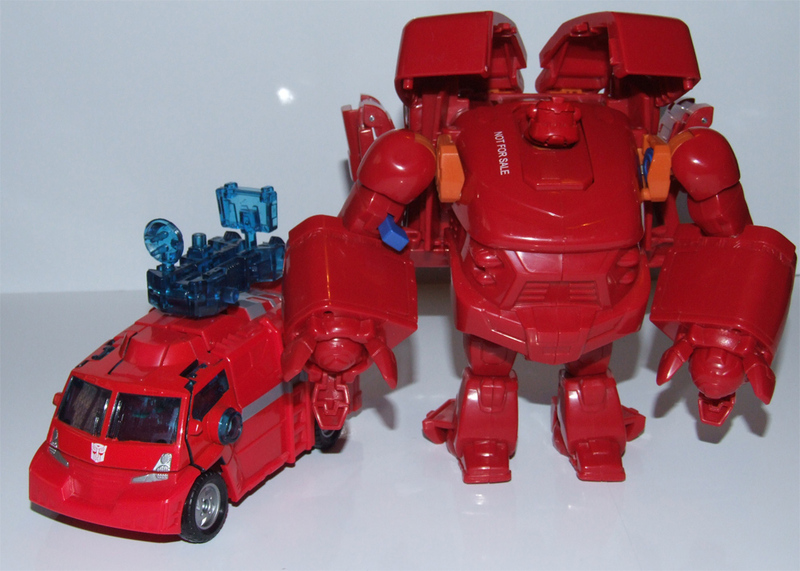 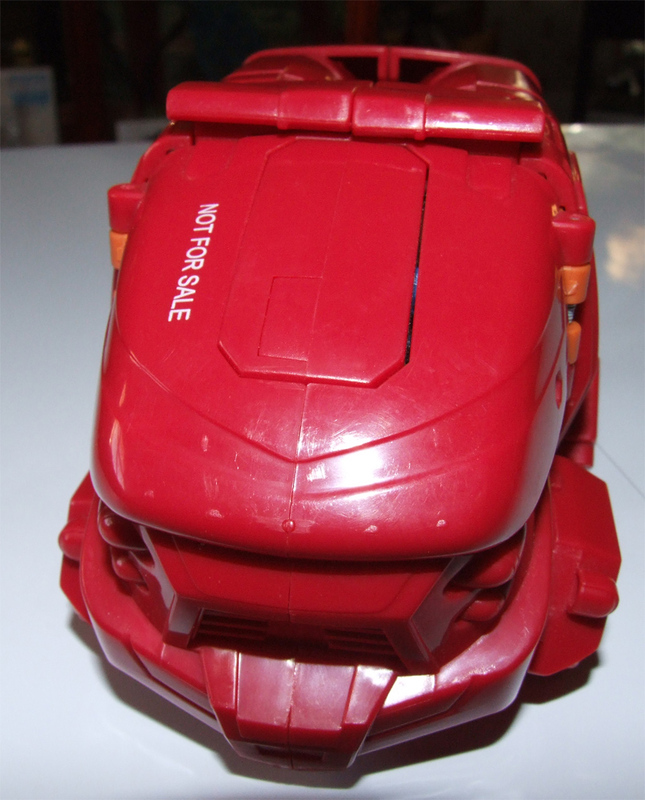 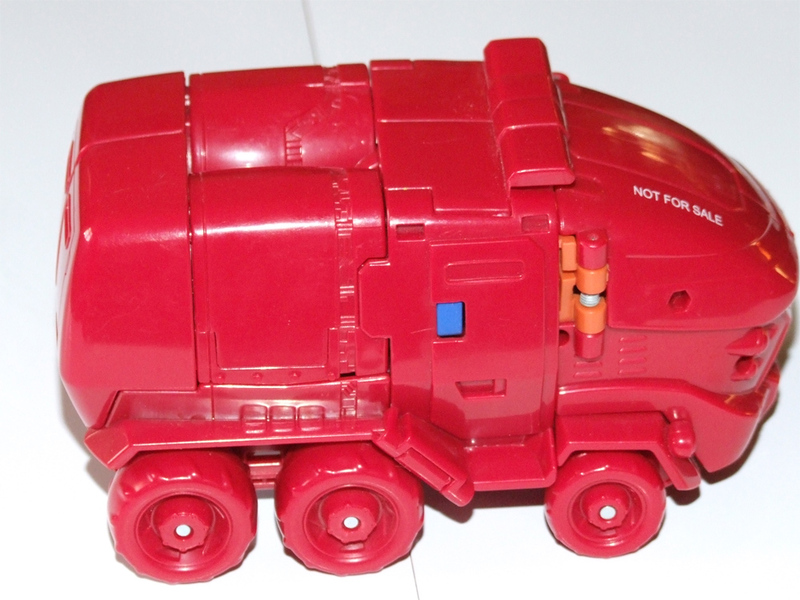 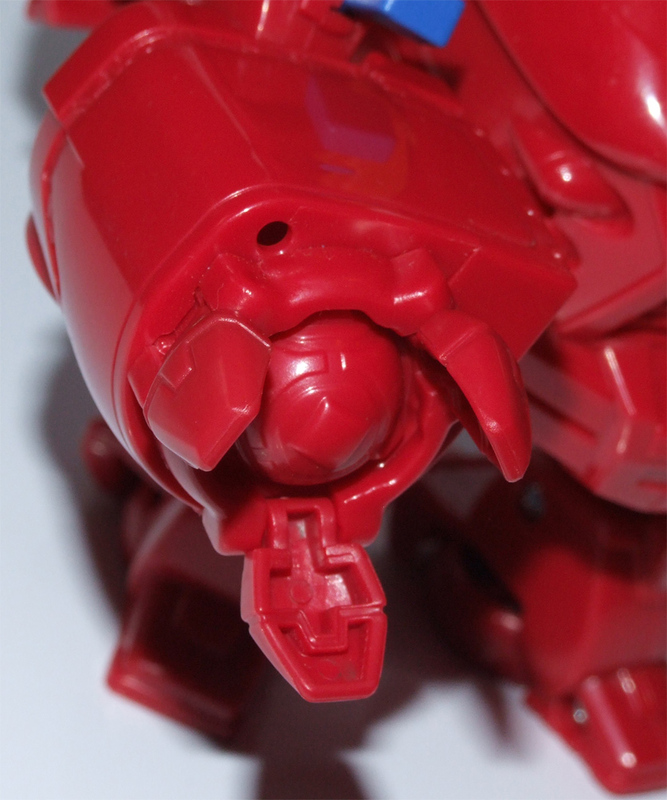 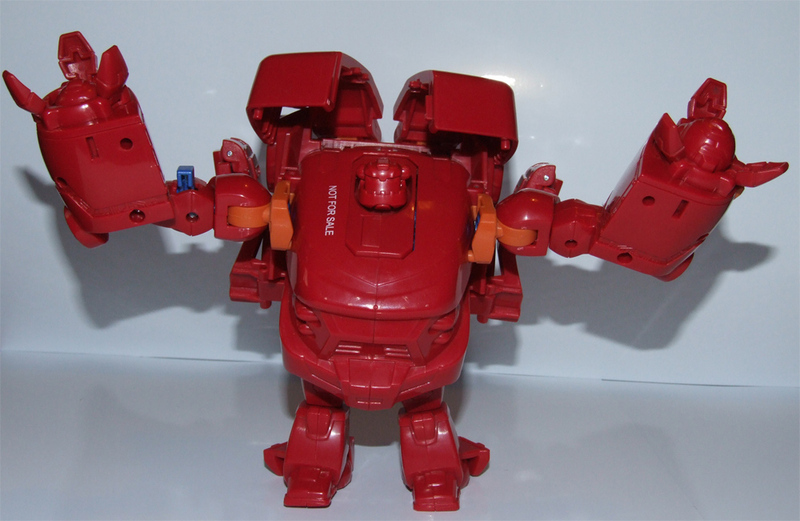 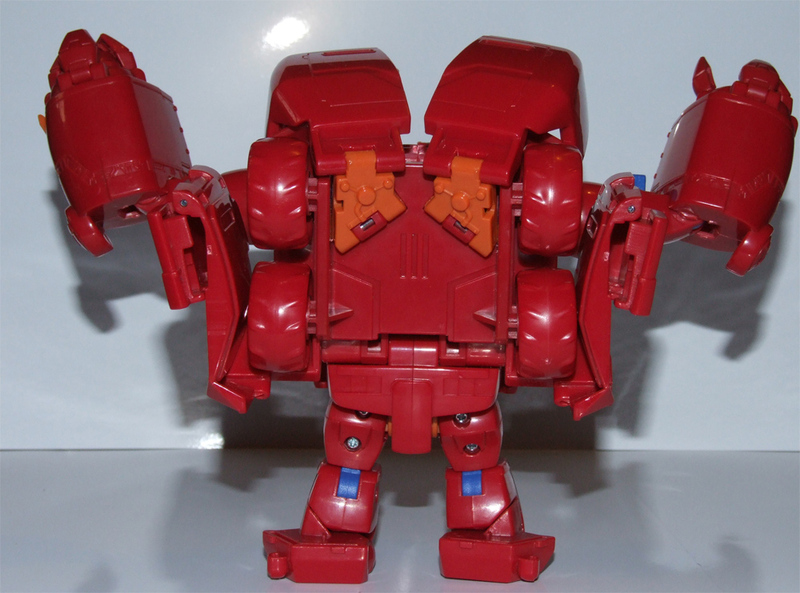 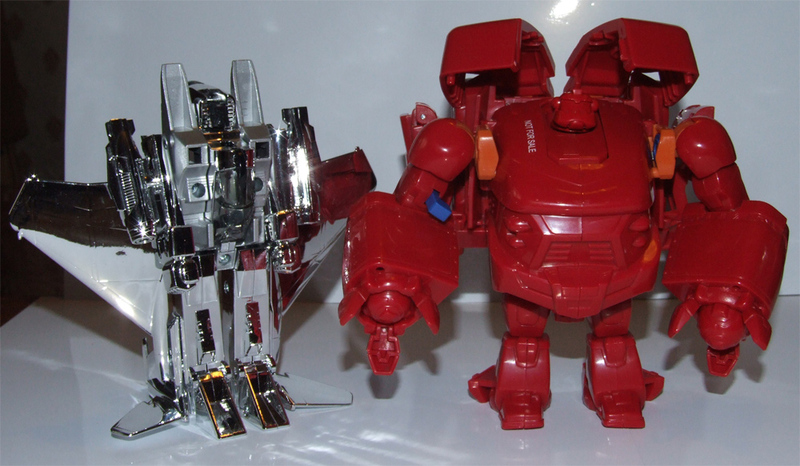 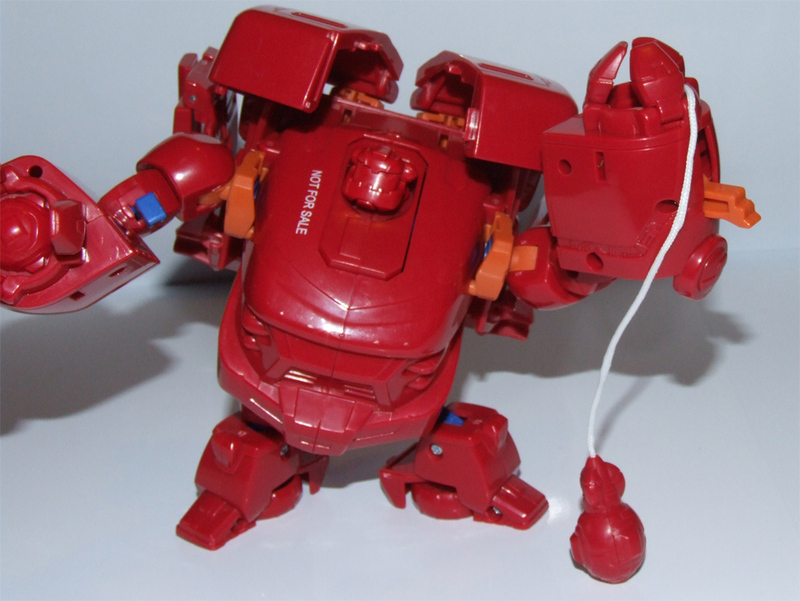 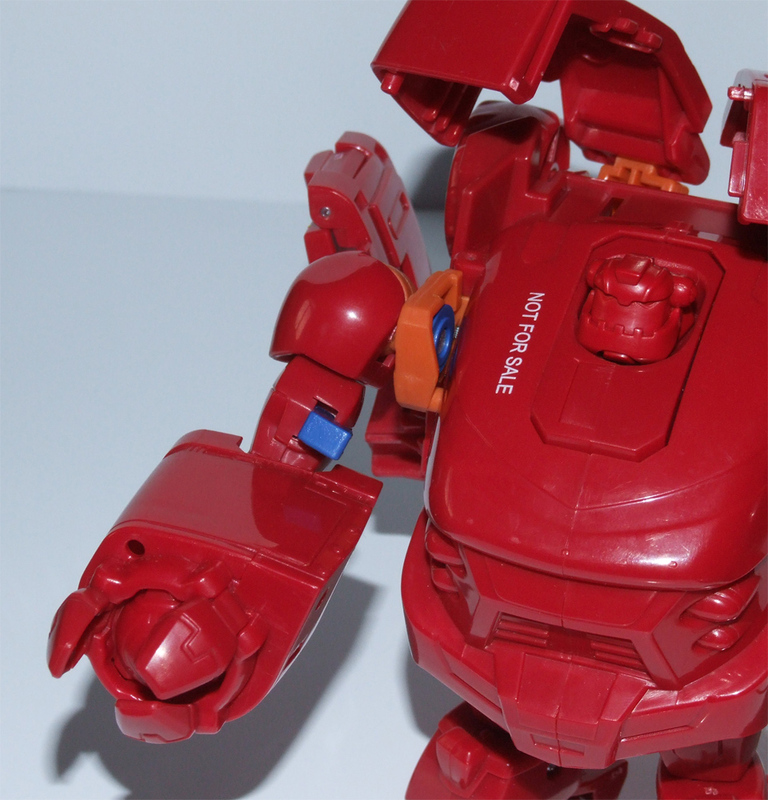 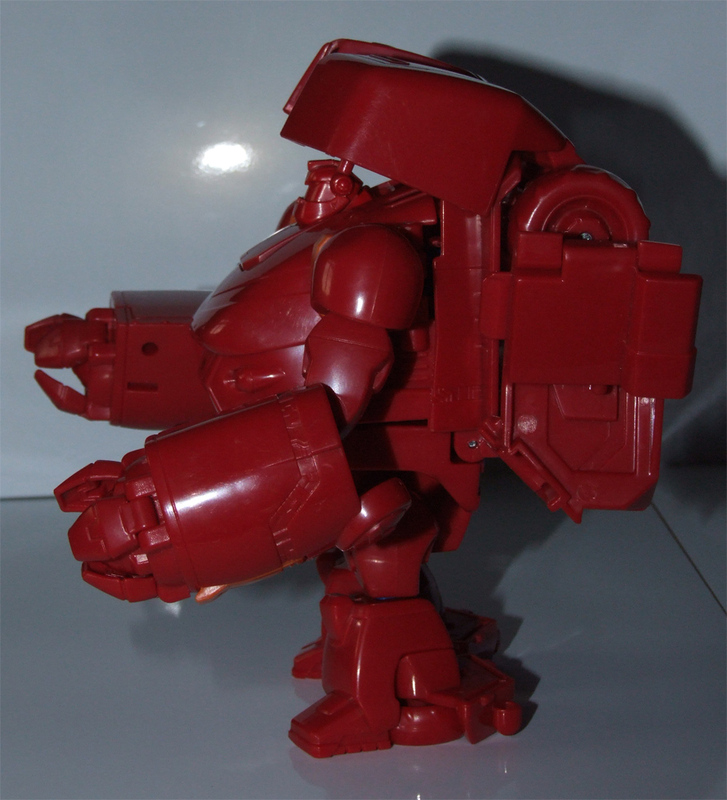 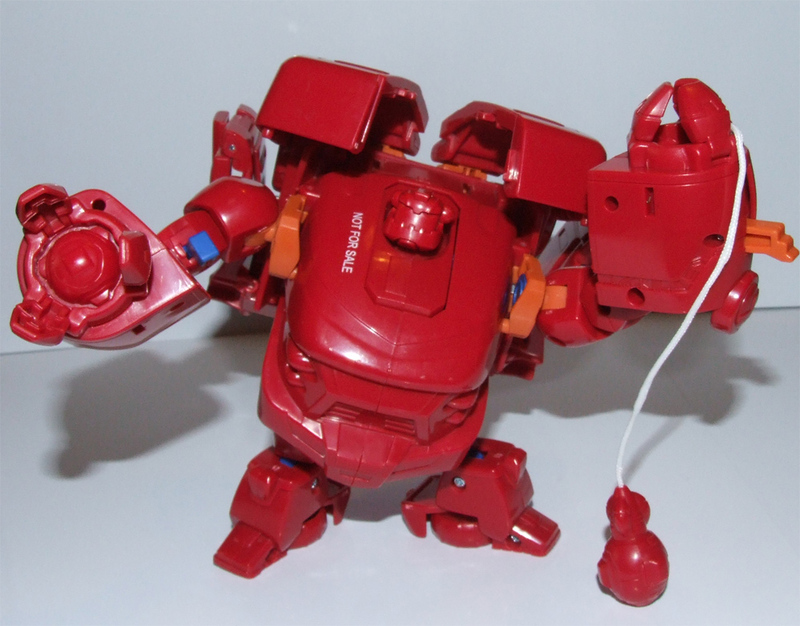 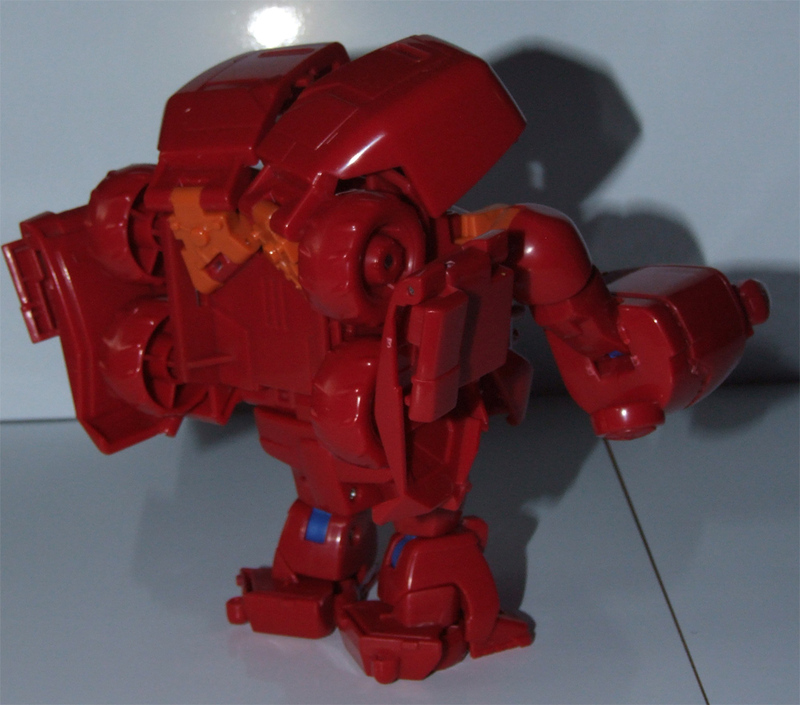 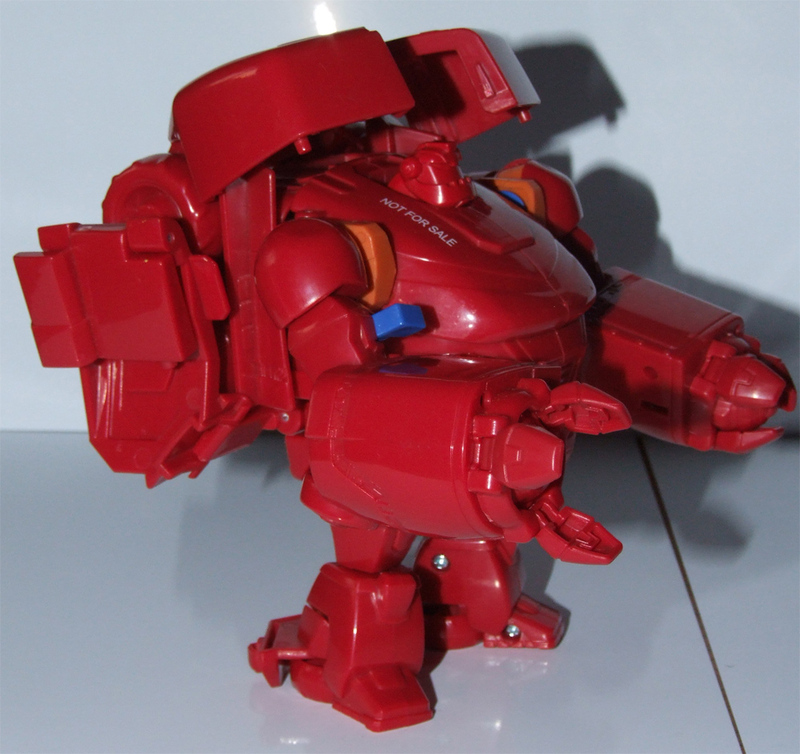 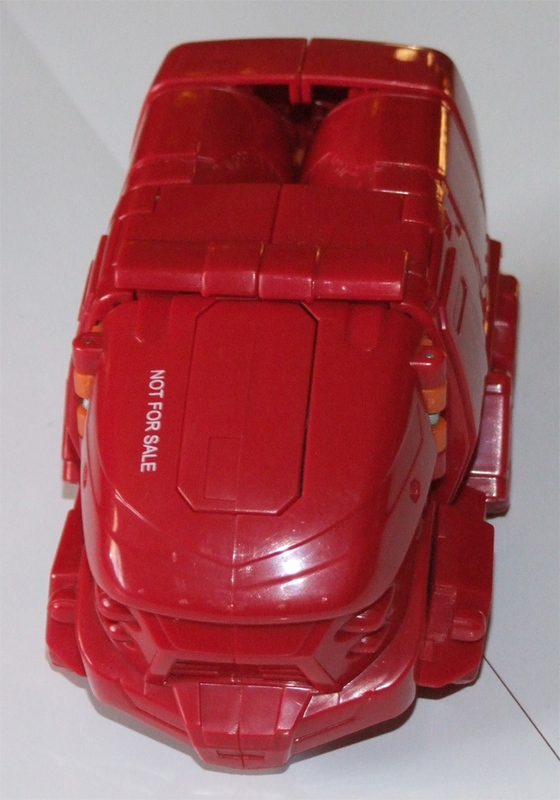 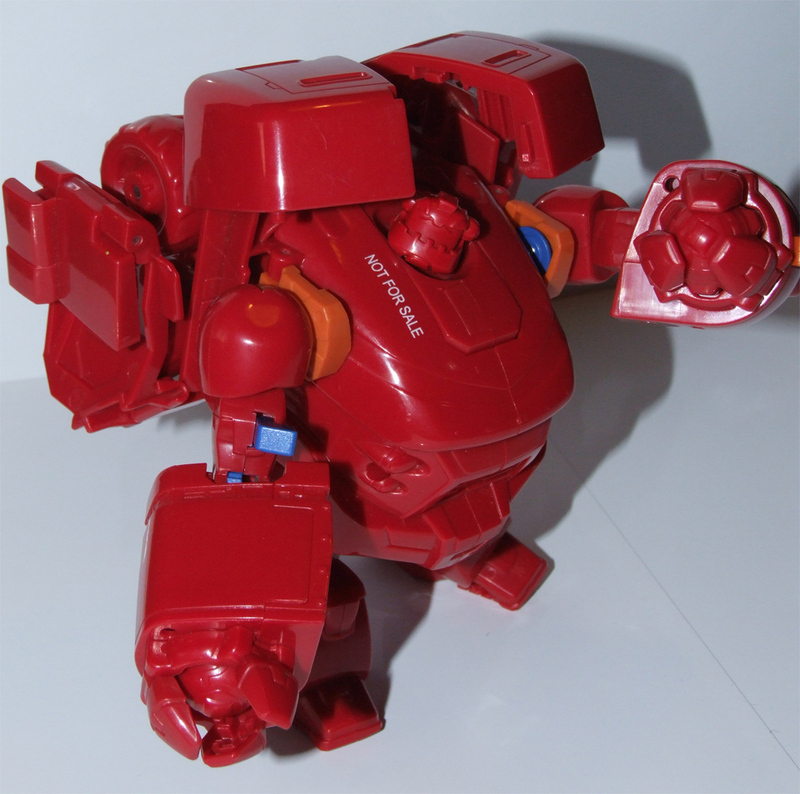 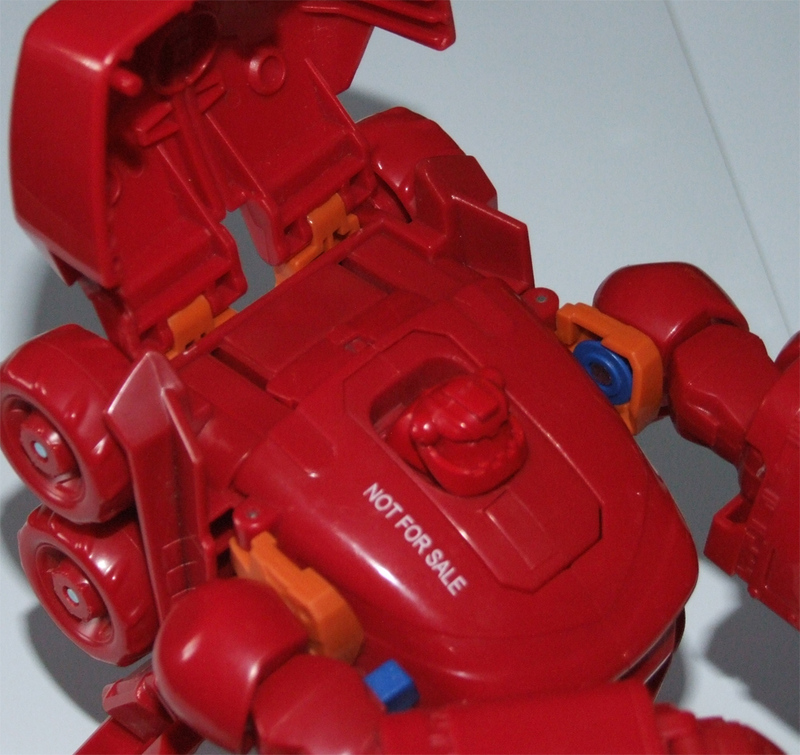 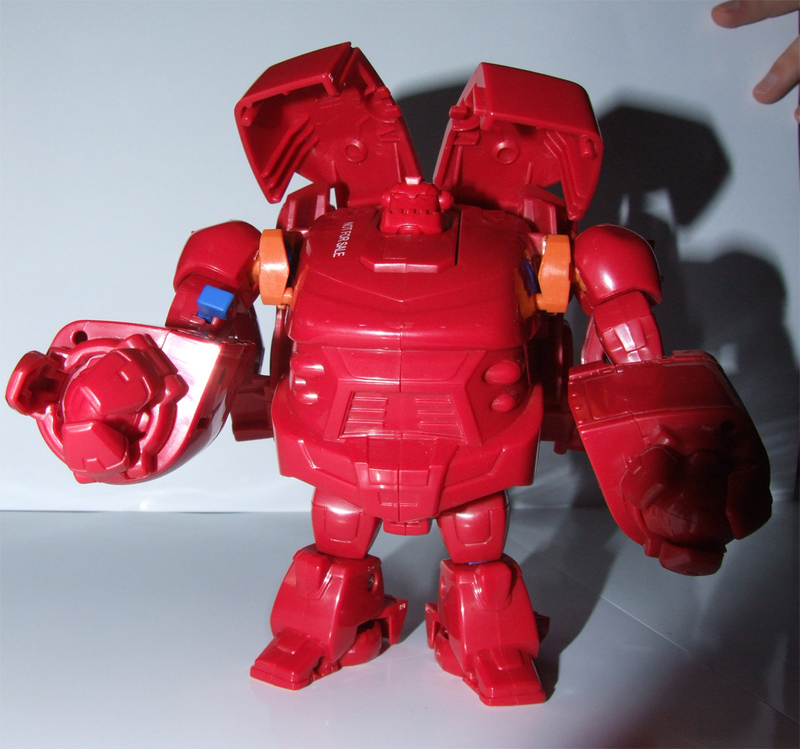 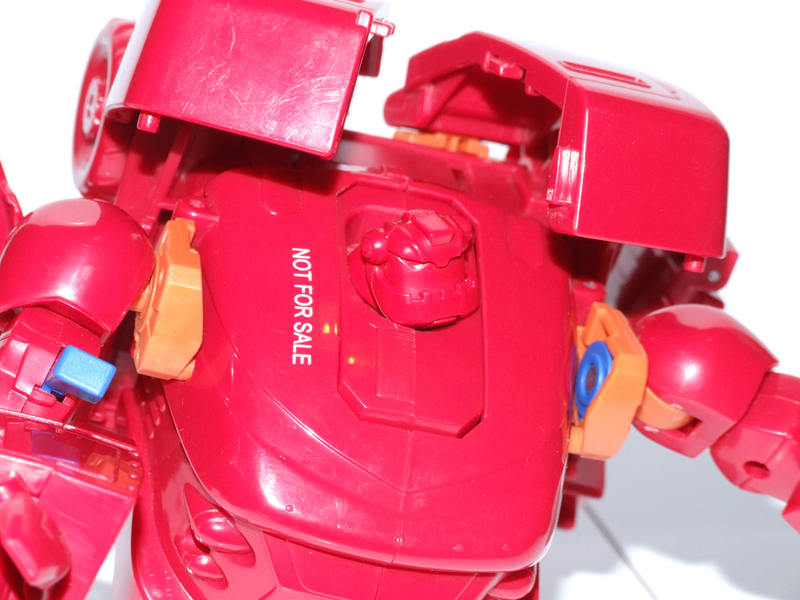 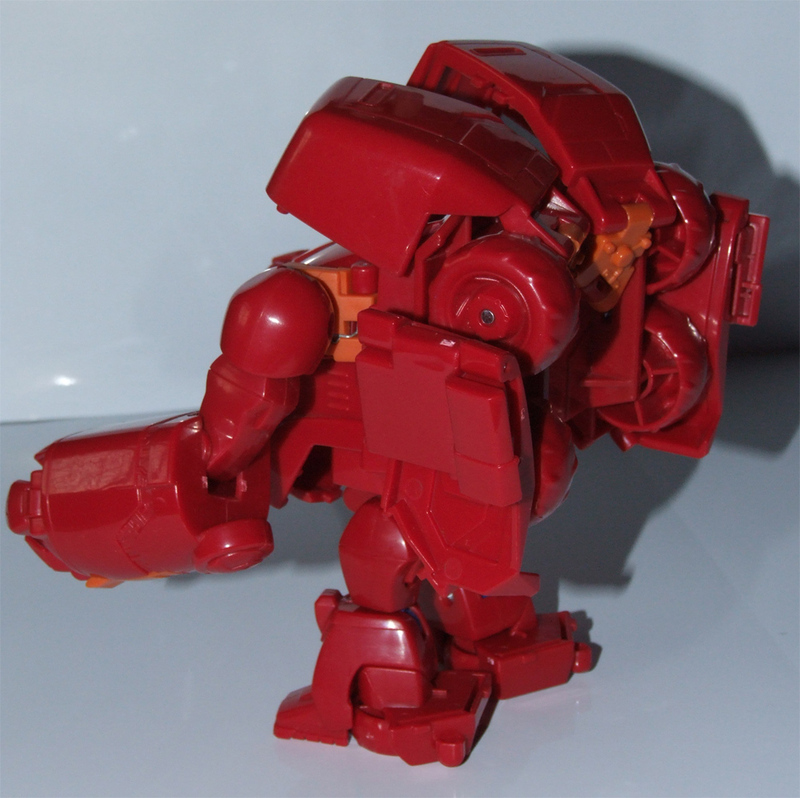 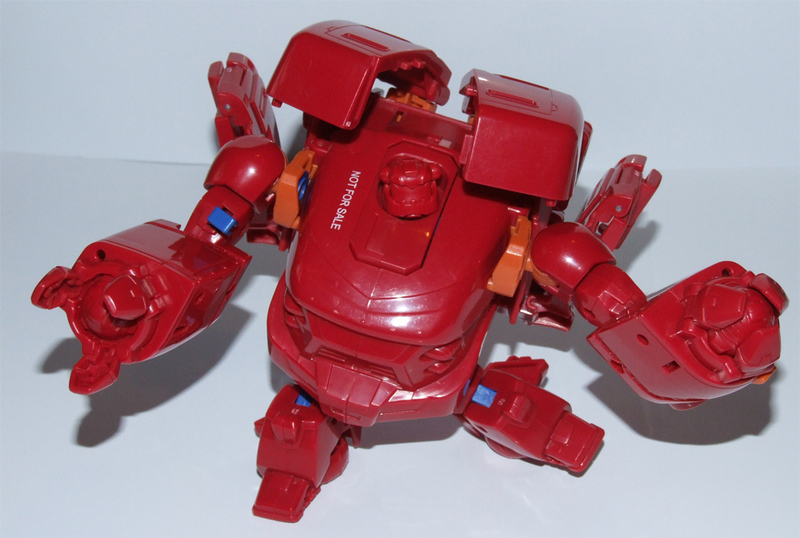 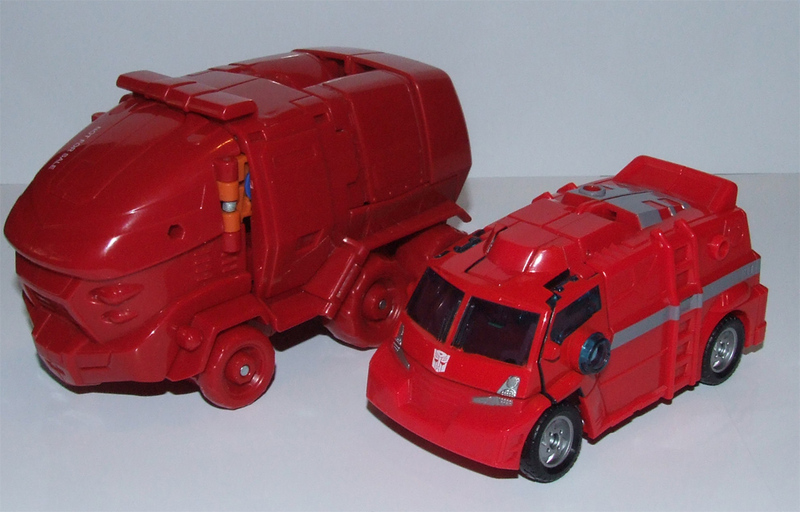 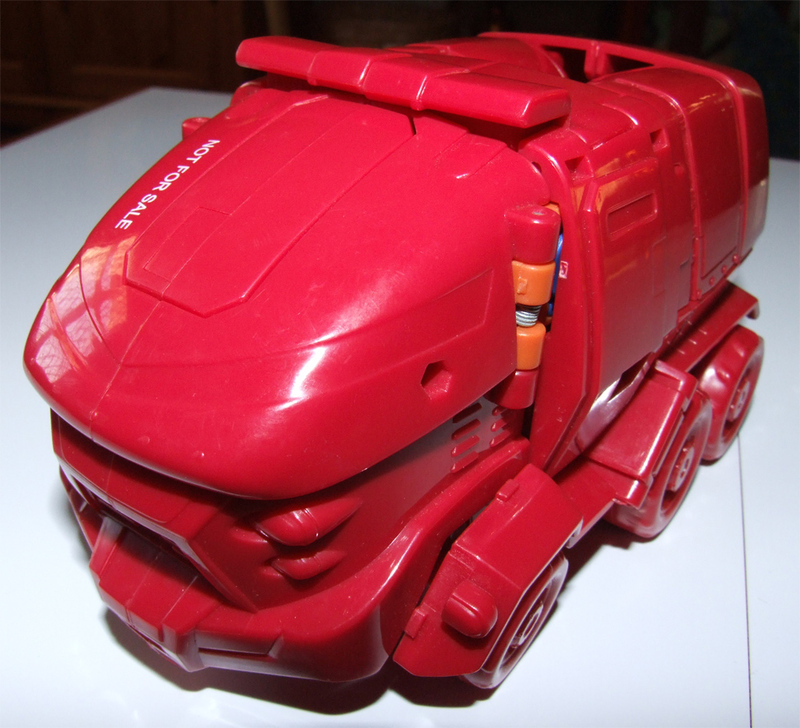 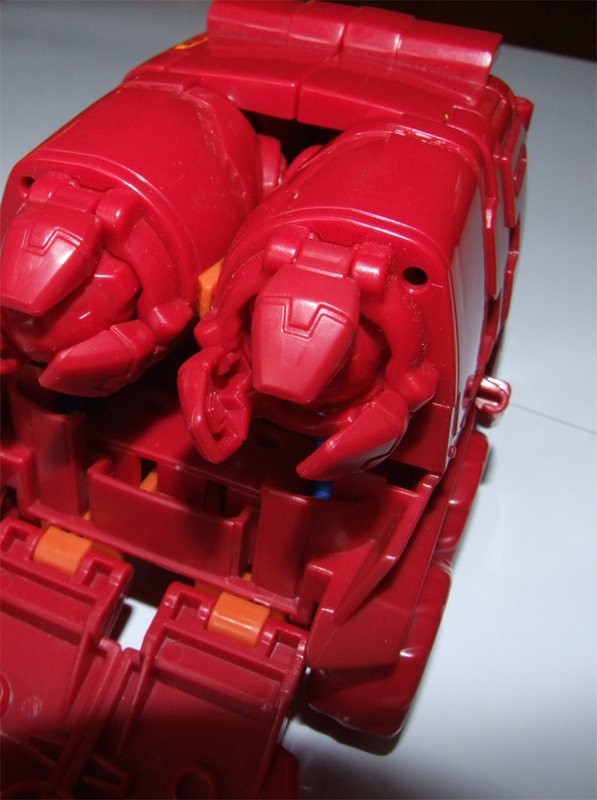 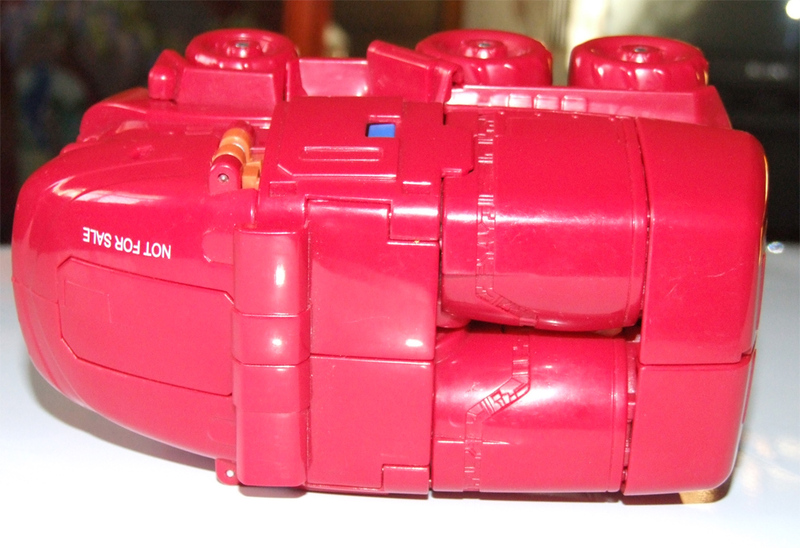 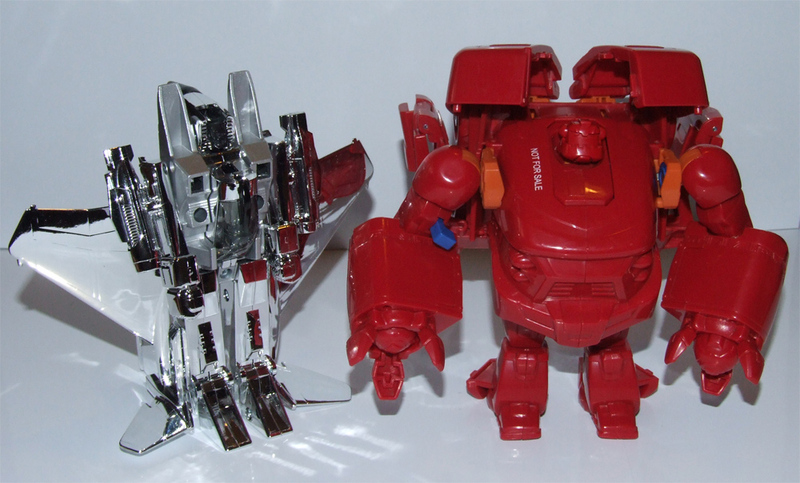 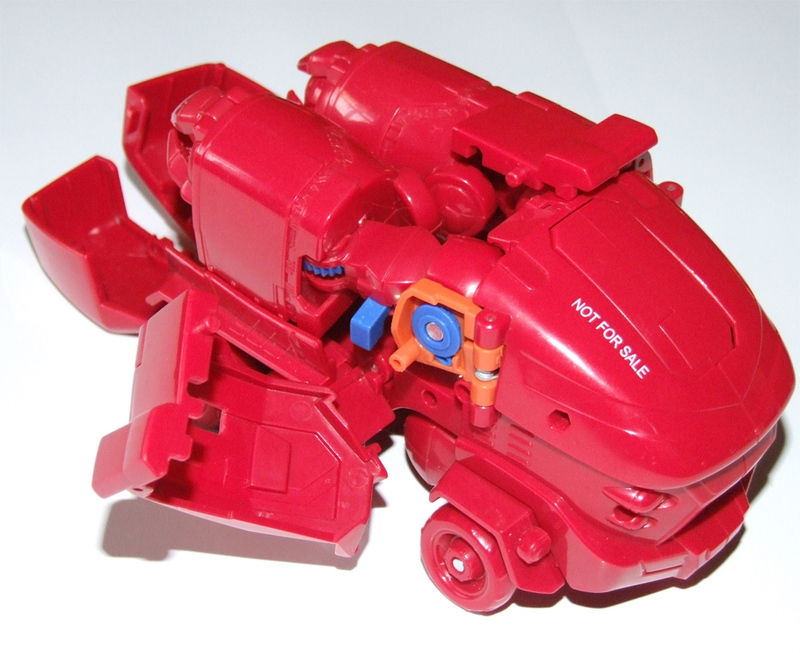 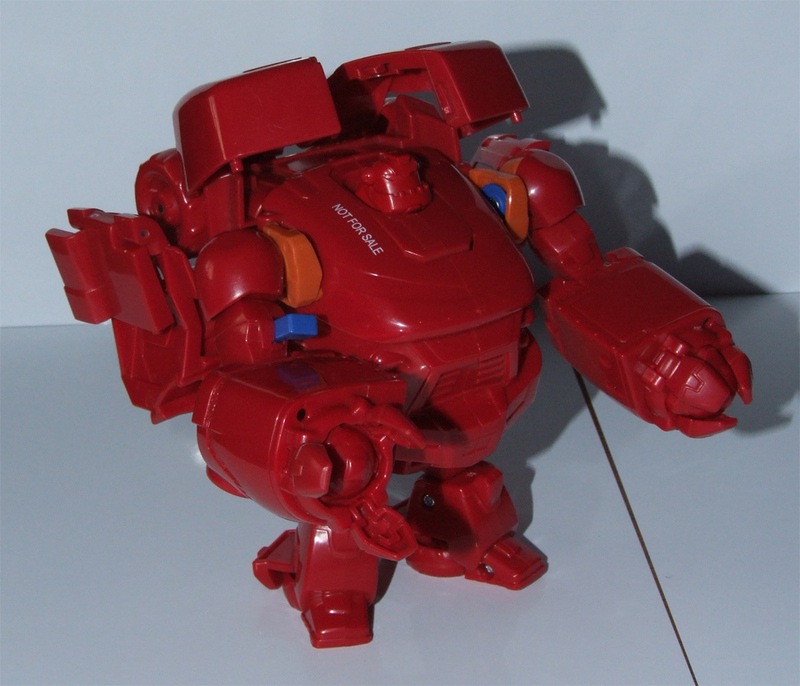 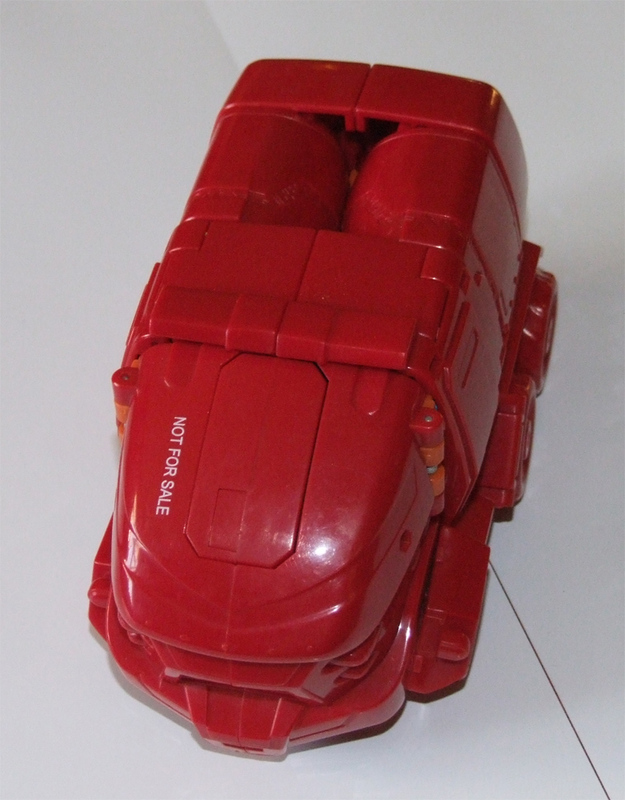 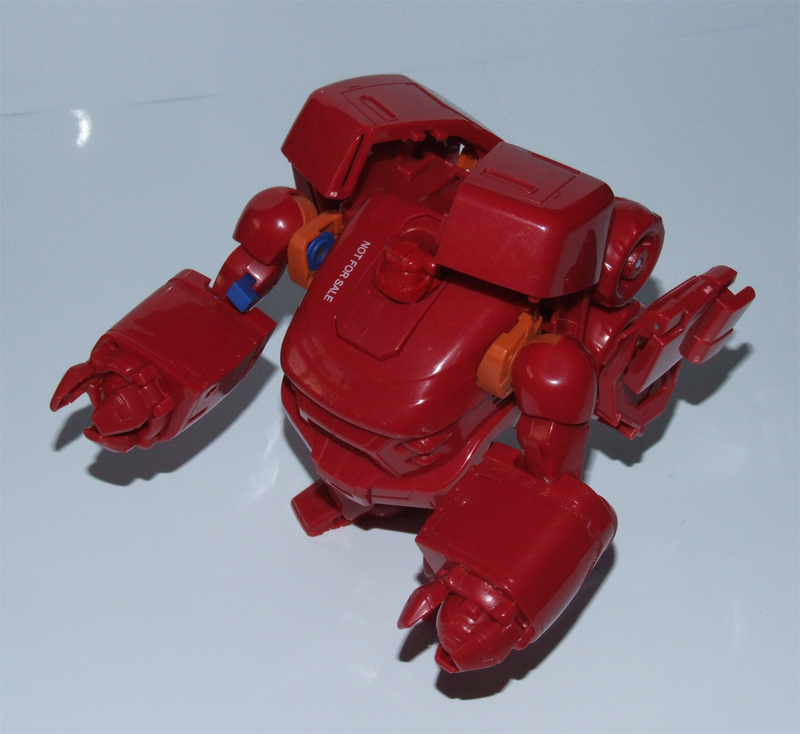 The red Bulkhead test-shot was our first Transformers Animated toy, having seen the toys during the Hasbro panel at BotCon 2007 we were very much looking forward to seeing what the toy was actually like in person. 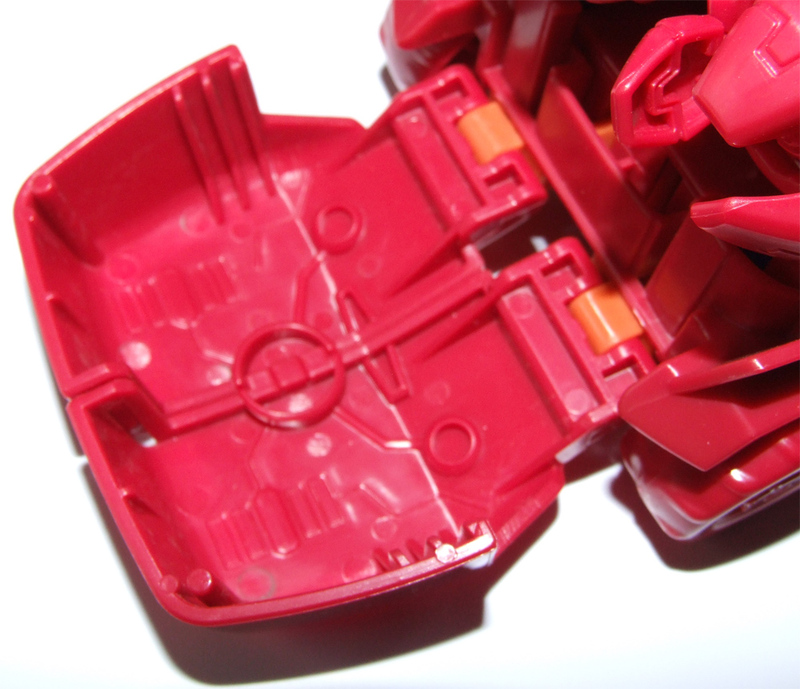 Its a little hard to decide what scale of toy Bulkhead is, the nearest is probably the Beast Wars Mega figures. 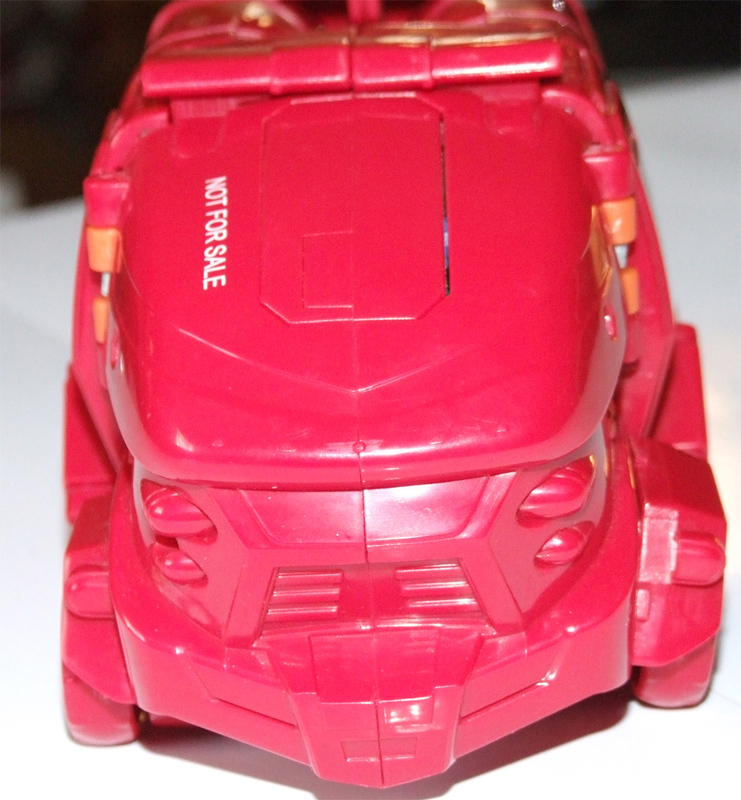 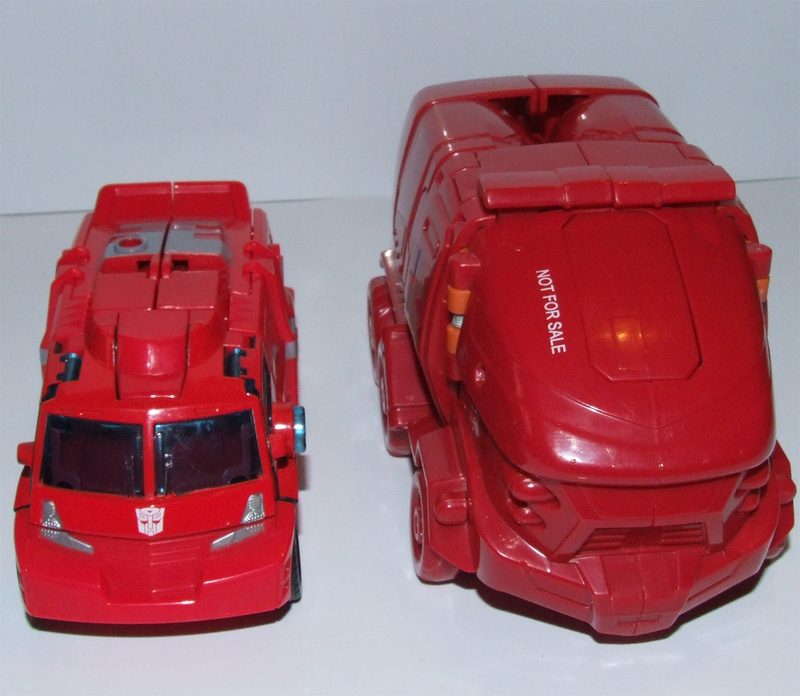 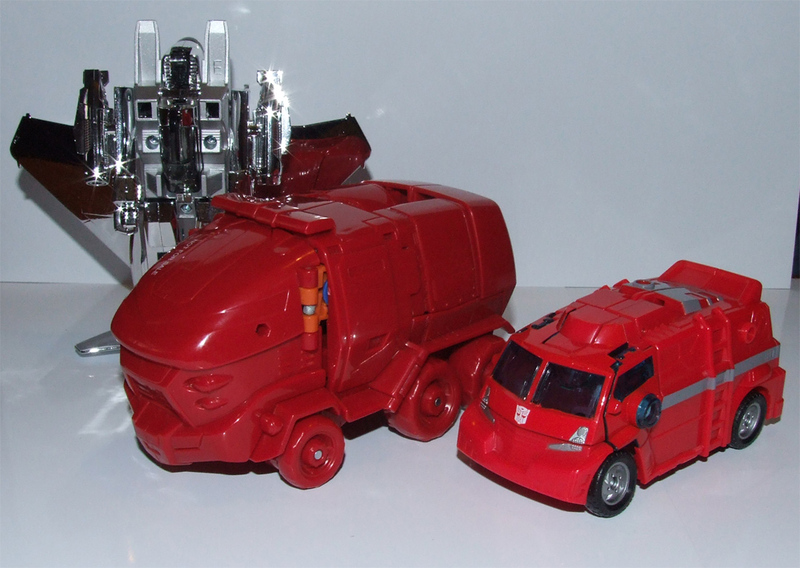 In vehicle mode the toy does not have any sort of gimmicks, and is a fairly plain sculpt though the toy is pretty cartoon accurate (due to the lack of detail in that style of art). 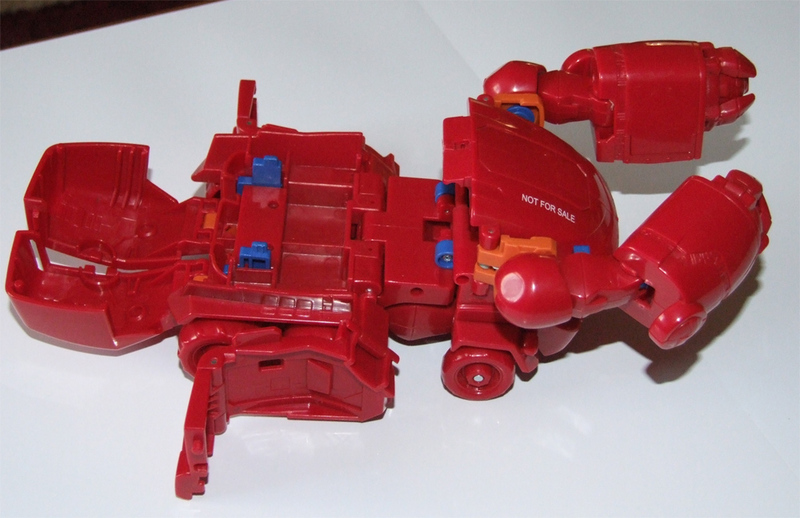 To transform the toy, you basically follow the Transformation sequence from the show, which helps to improve what is really a basic transformation. 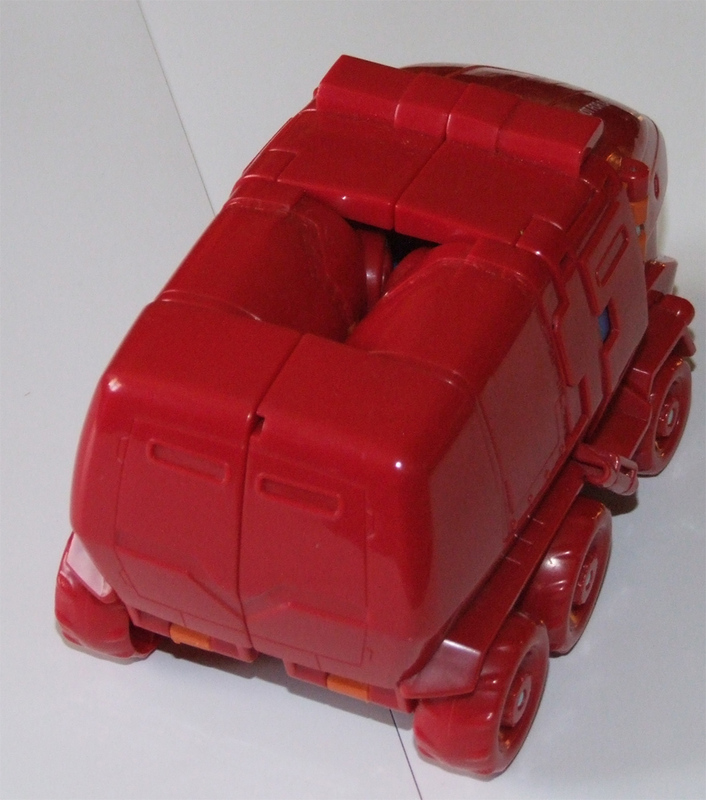 To start with you open the back of the truck and then fold out the side. 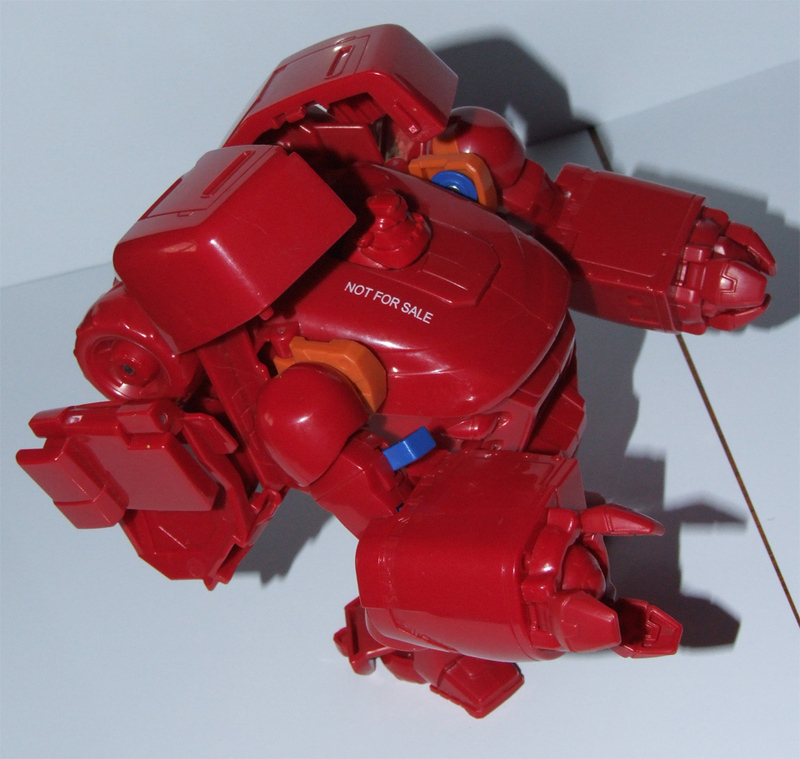 By doing this the arms automatically swing out to the chest, as they are spring loaded. 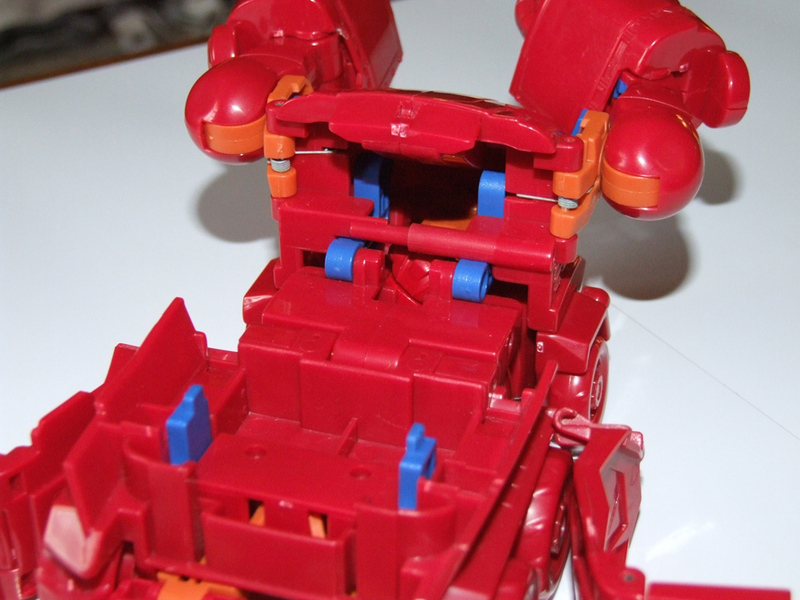 The legs, which are very small, fold out from underneath the cab, with the wheels rotating to become the heals of the robot. 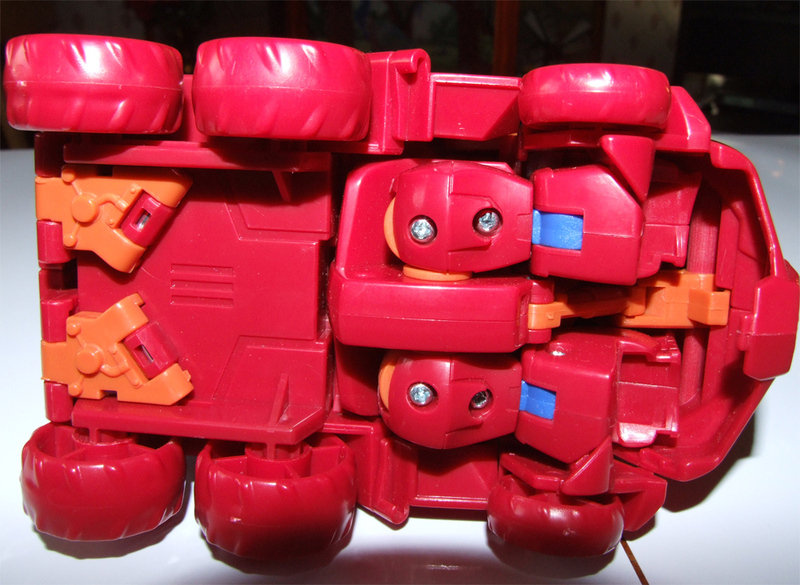 When you rotate the cab down, the head automatically. 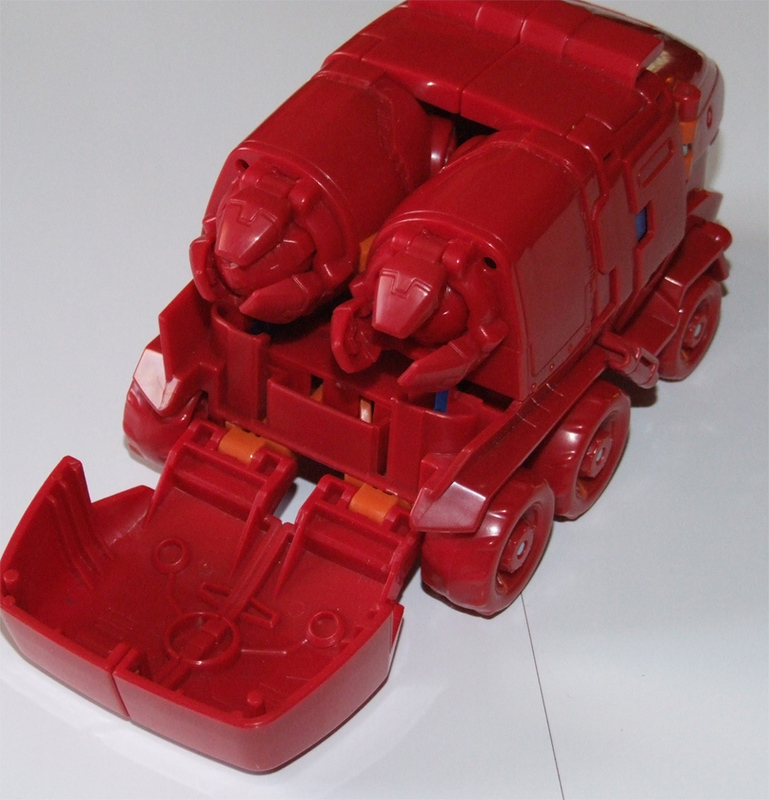 What is left of the back of the truck then folds up and clips onto the shoulders. 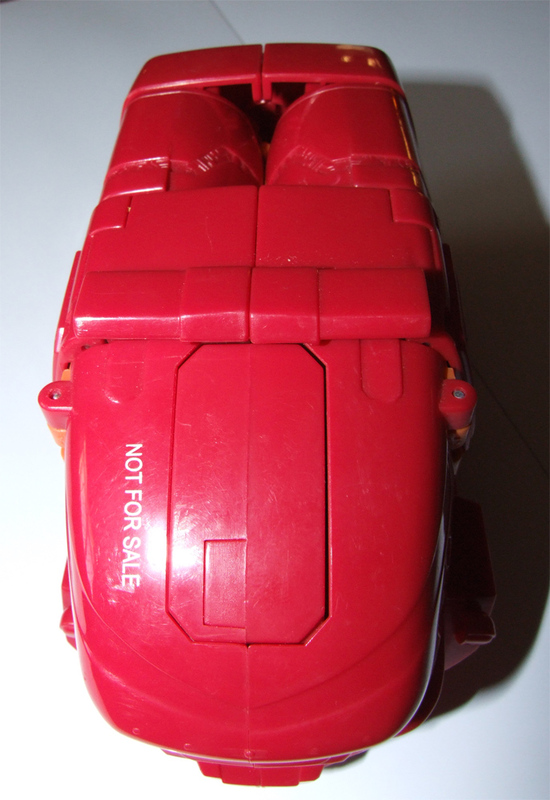 The back doors then separate, pull out slightly and bend over the shoulders. 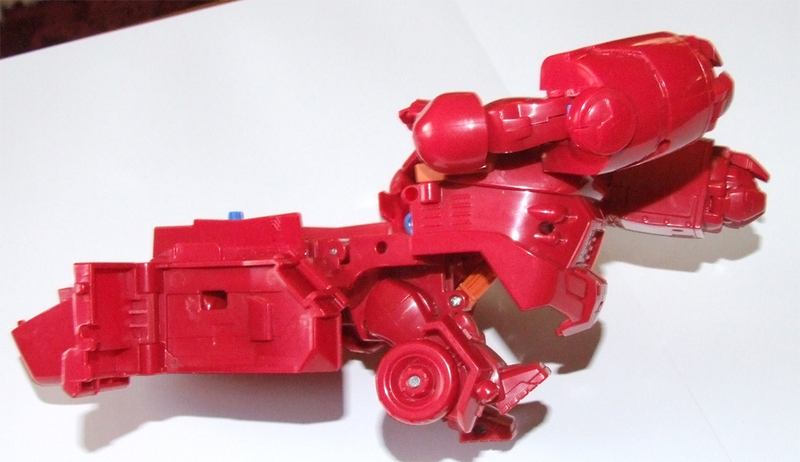 The toy has gimmicks in robot mode, one on each arm. 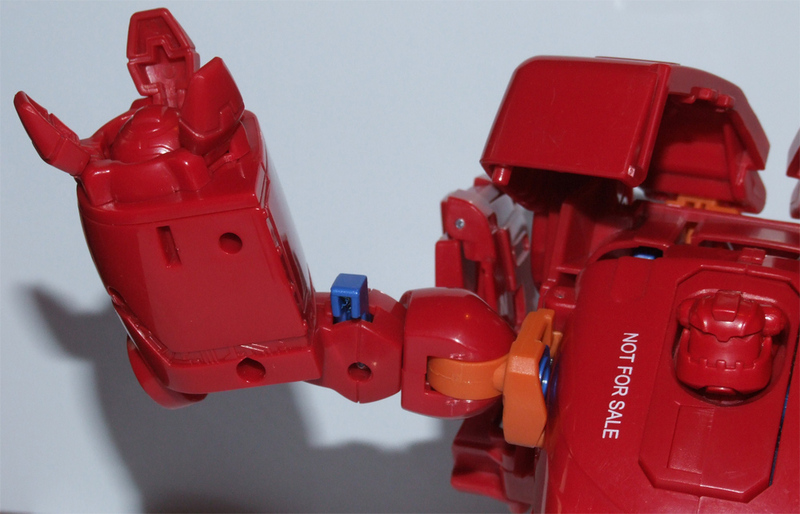 The right arm has a little lever which, when pushed, makes the arm bend at the elbow. 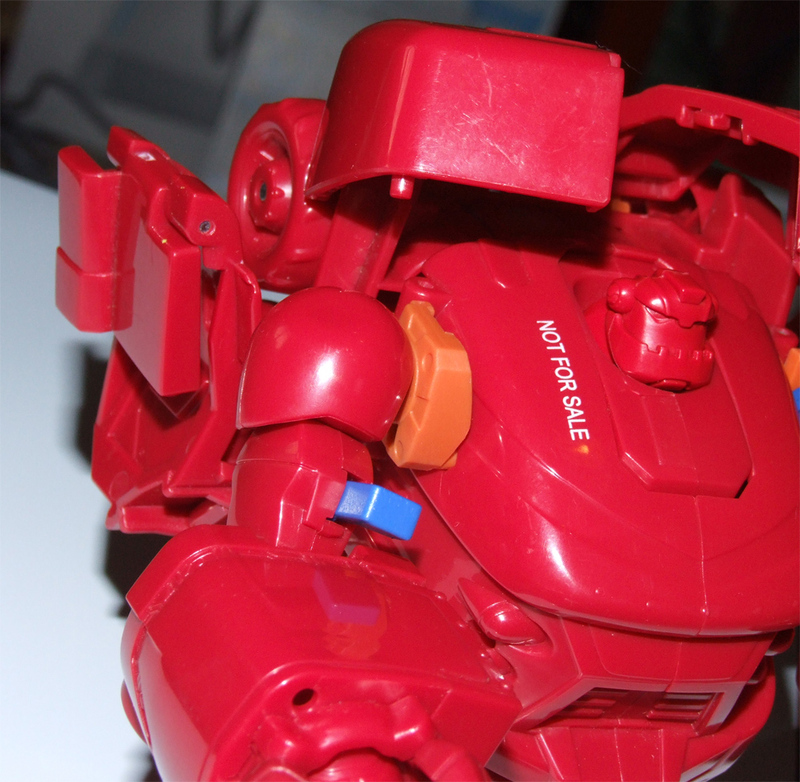 On the test-shot that we own, this does not work very well. 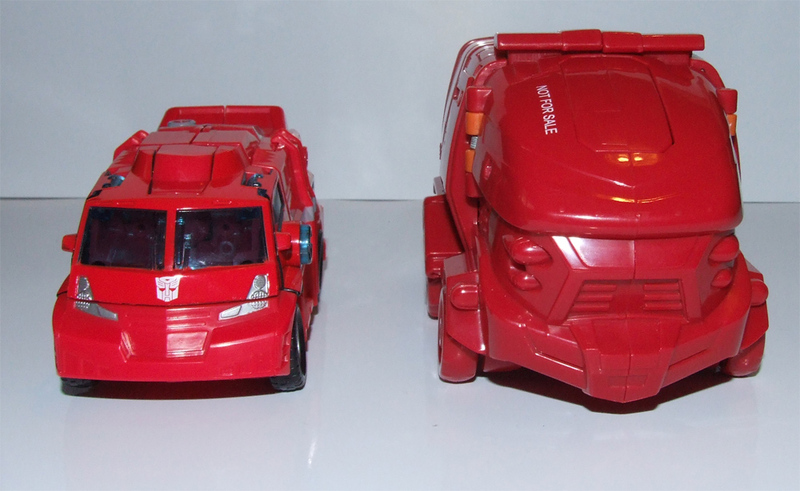 Hopefully Hasbro and TakaraTomy will have improved on this with the final release. 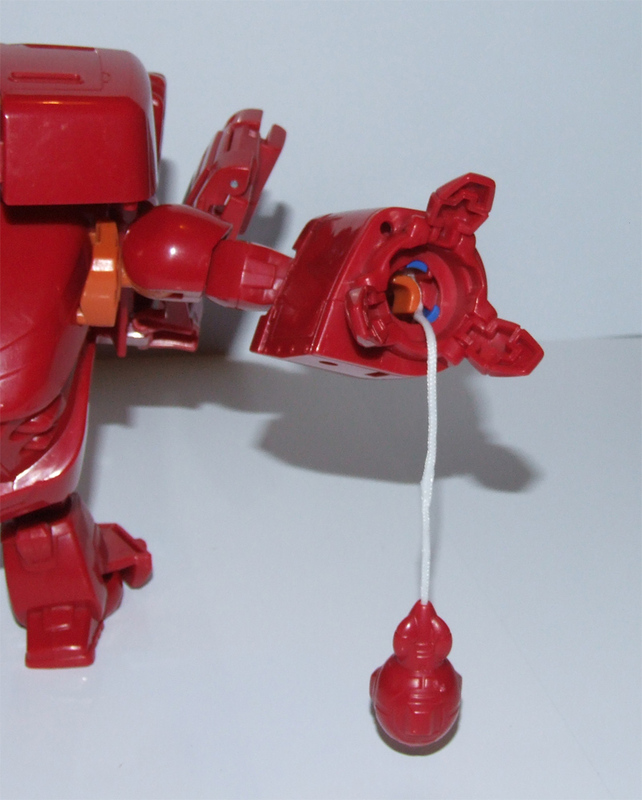 The second gimmick is on the left arm and is the firing toys mace gimmick. 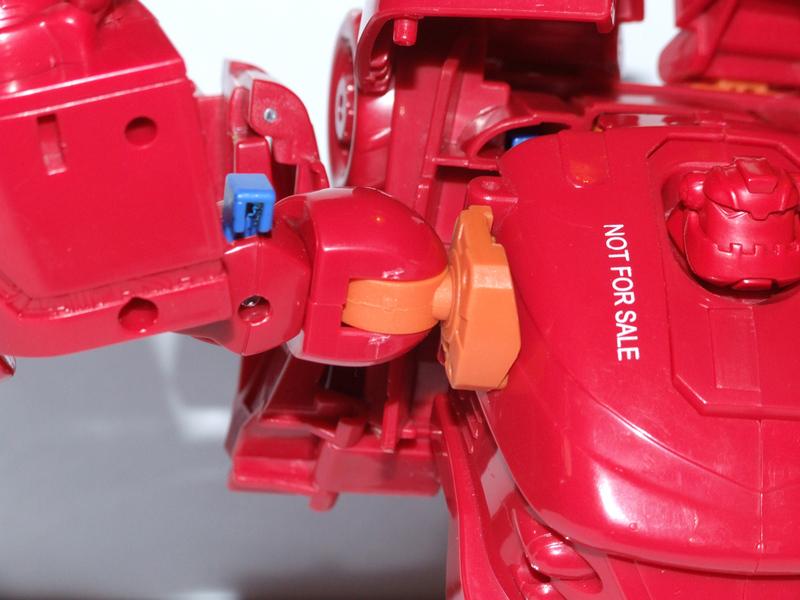 There is a level on the outside of the arm, which when pulled, fires the mace from the toys hand. 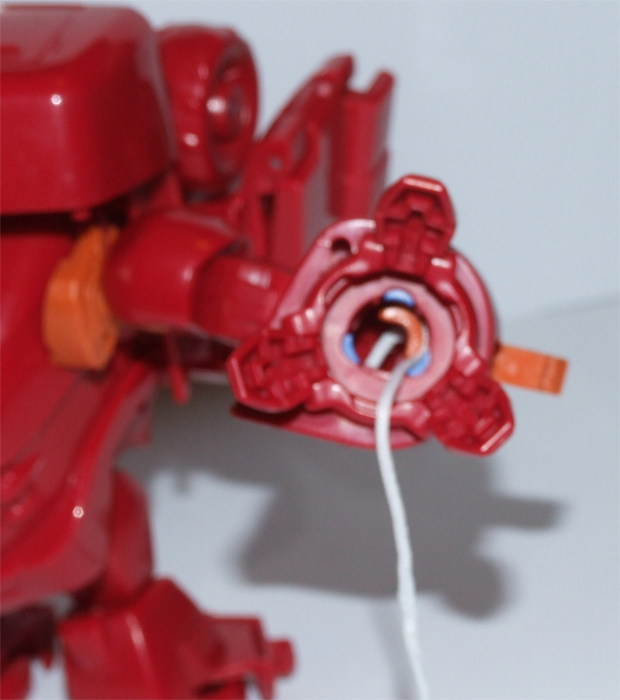 The mace is attached by string to the inner arm and is long enough to safely swing around without hitting the main figure allowing you to recreate scenes from the show. 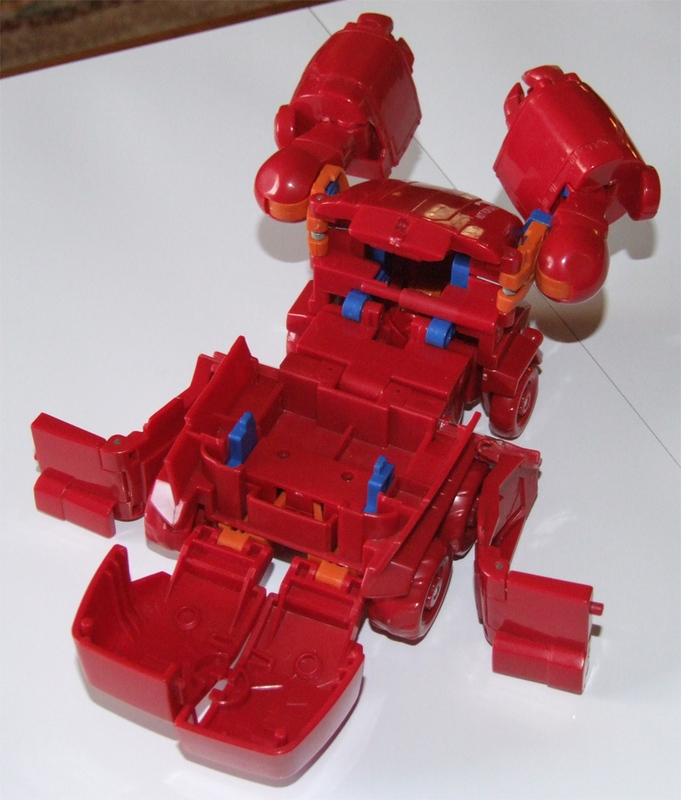 The toy is fairly articulated in both the arms and legs. 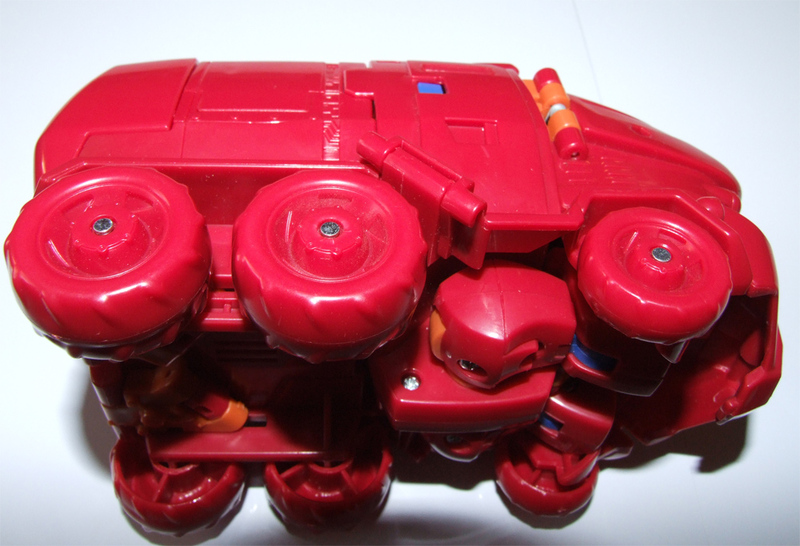 The arms in particular have four joints. 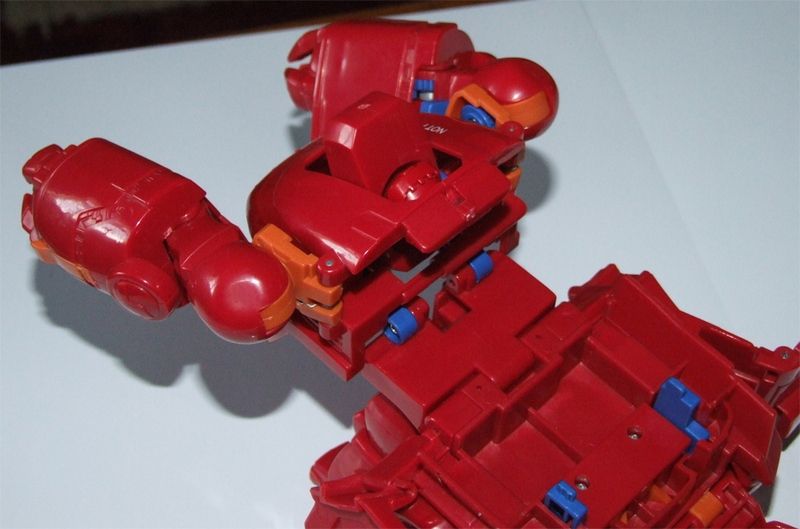 One joining the arm onto the main torso, another just below the shoulder and one at the elbow. 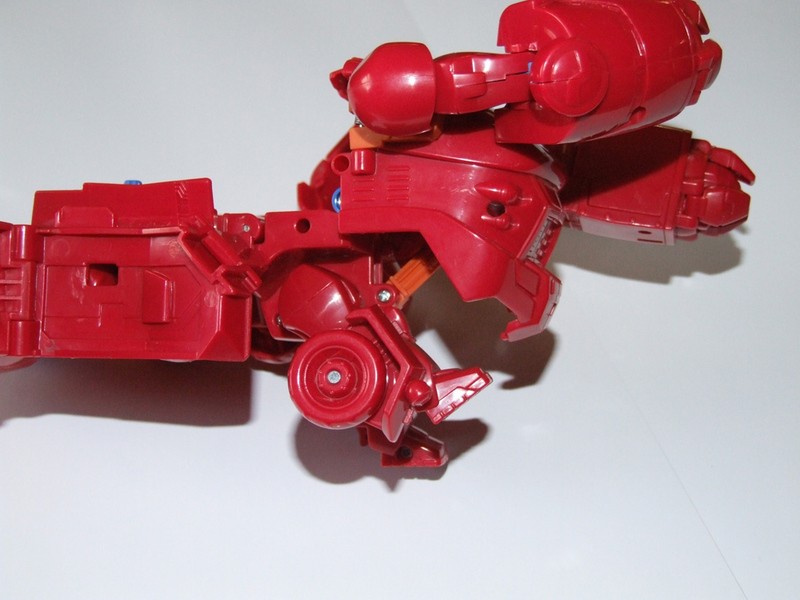 All in all, the arms are quiet similar to the 3 3/4 inch G.I-Joe figures. 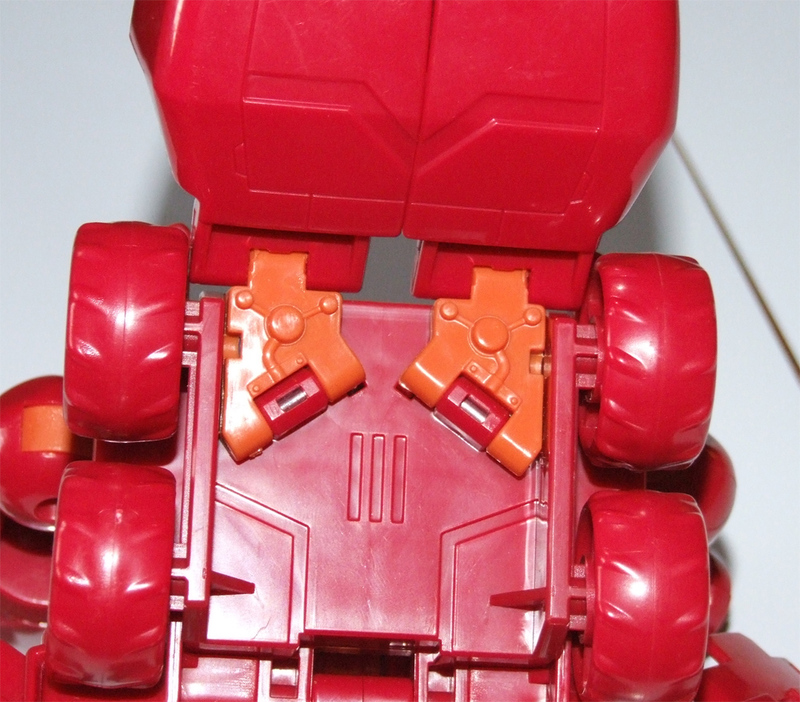 The head is connected via a ball-and-socket joint, which means that the head can be rotated fairly easily. 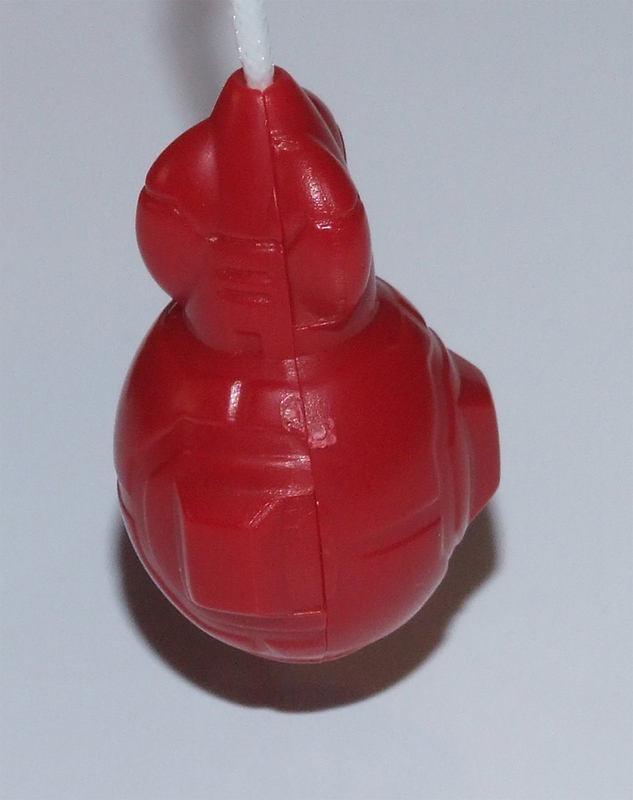 Unfortunately, the head pops off a lot of the time on our test-shot. 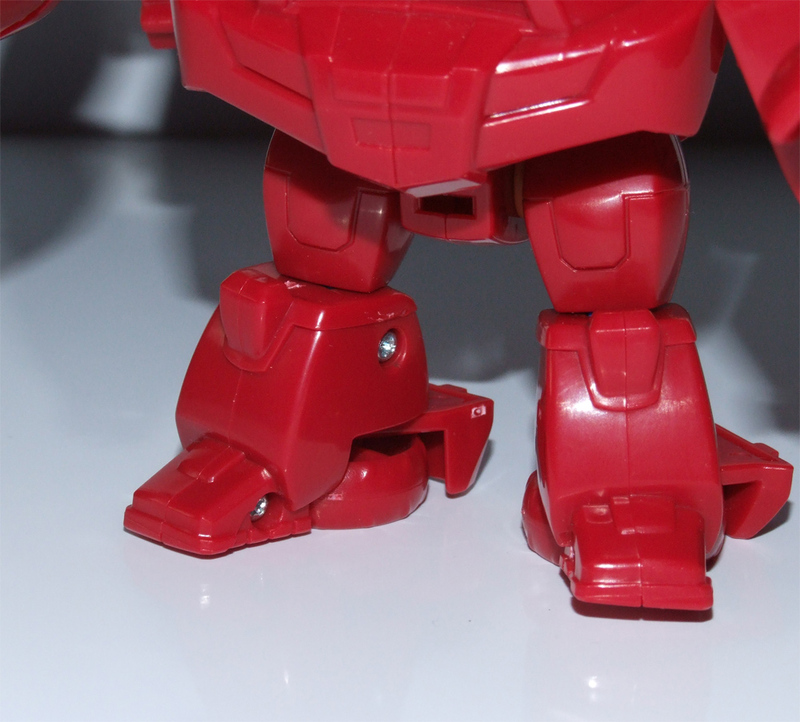 Again, hopefully this will be resolved on the final figure. 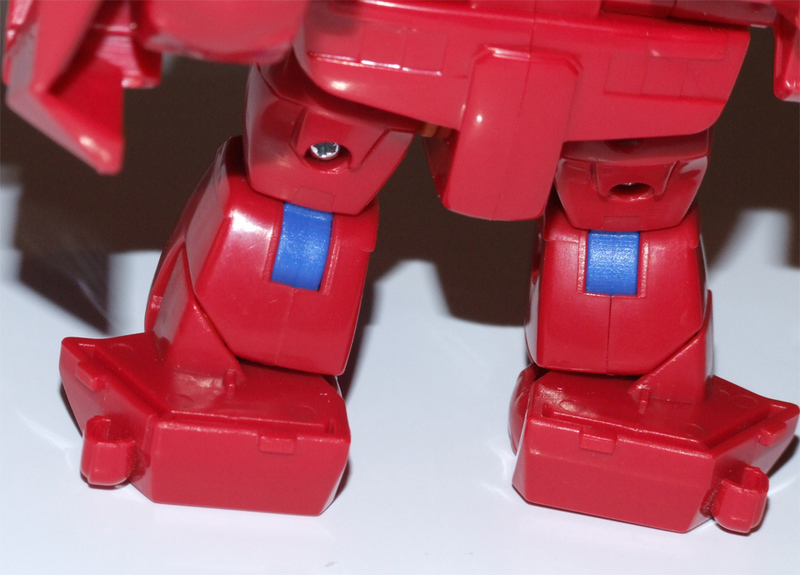 The toys legs are also well articulated, the can bend and rotate at the knees as well as rotating and the hips. 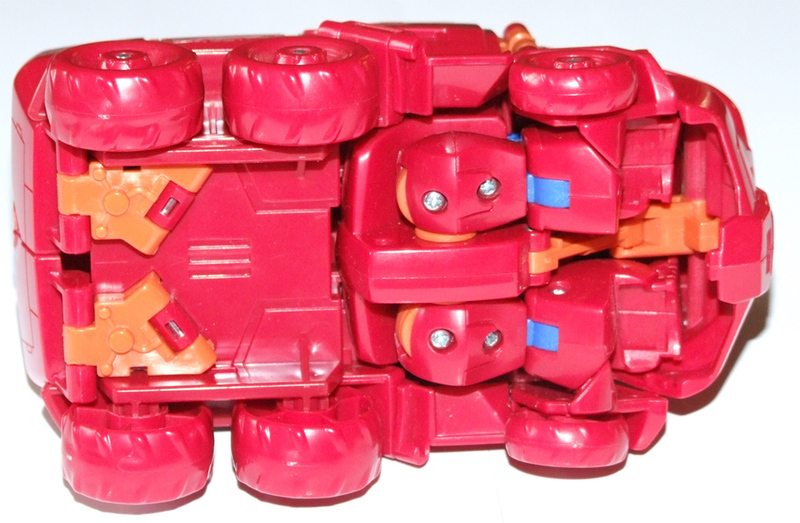 It is possible for the toy to do the splits in both directions. 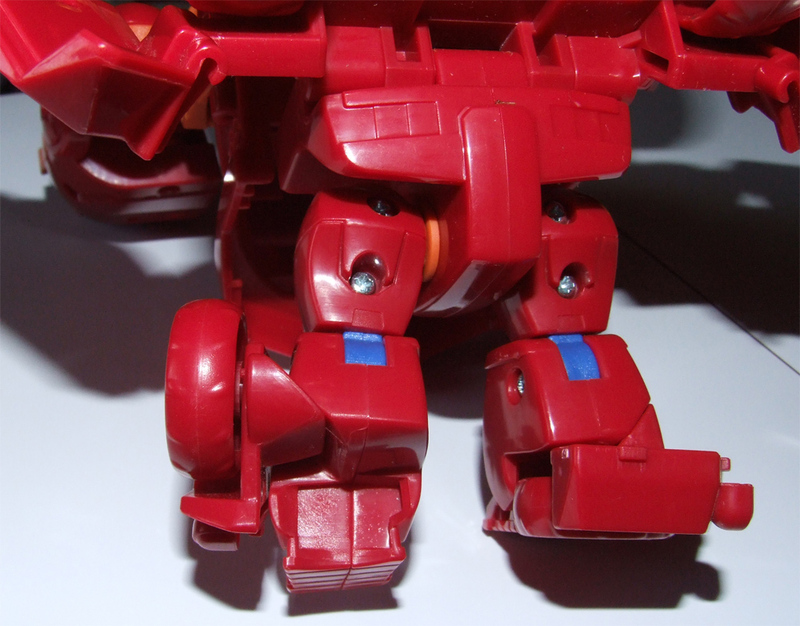 The only problem with the legs are that they are very small. 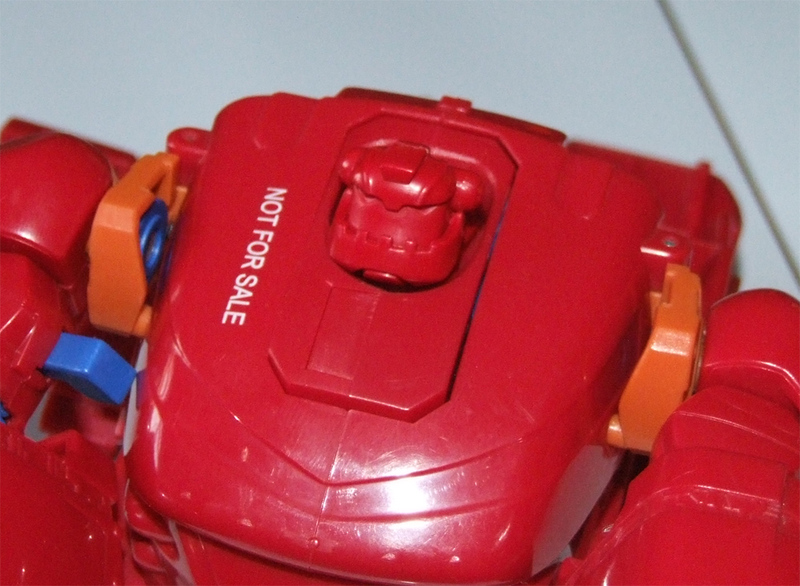 This is, however, in keeping with the design of character, and so is not really a flaw. 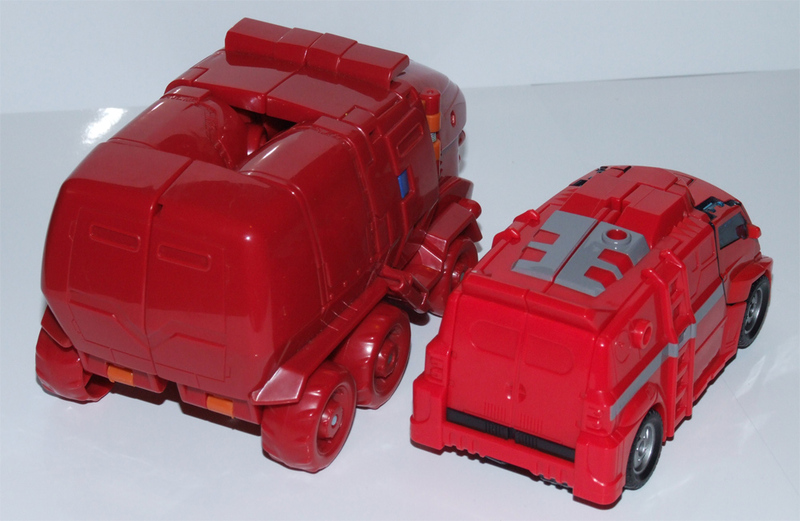 We have taken some size comparison images of the toy along side a Generation One jet, a 6 inch Titanium figure and an Energon deluxe mould. 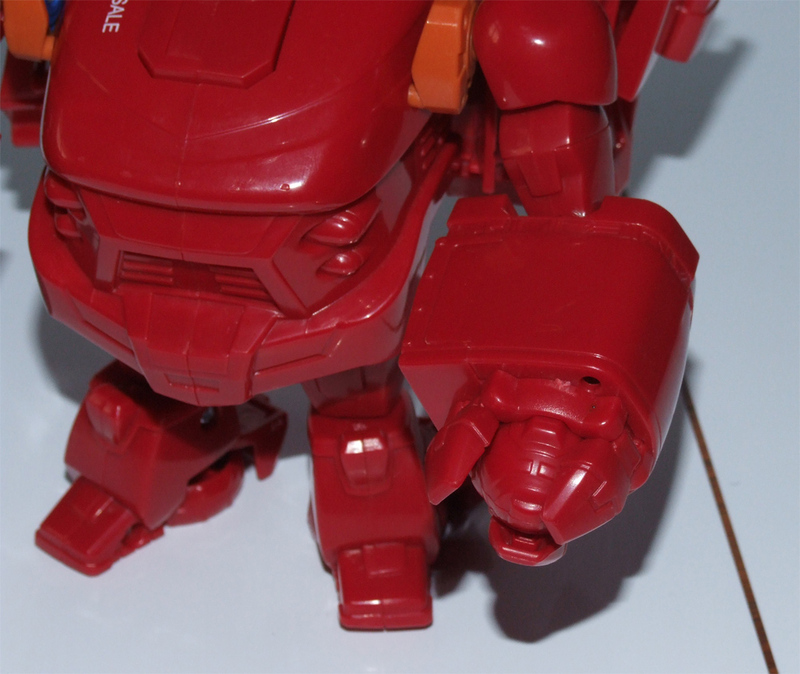 Another problem with the test-shot, is that the body does not clip together very well. 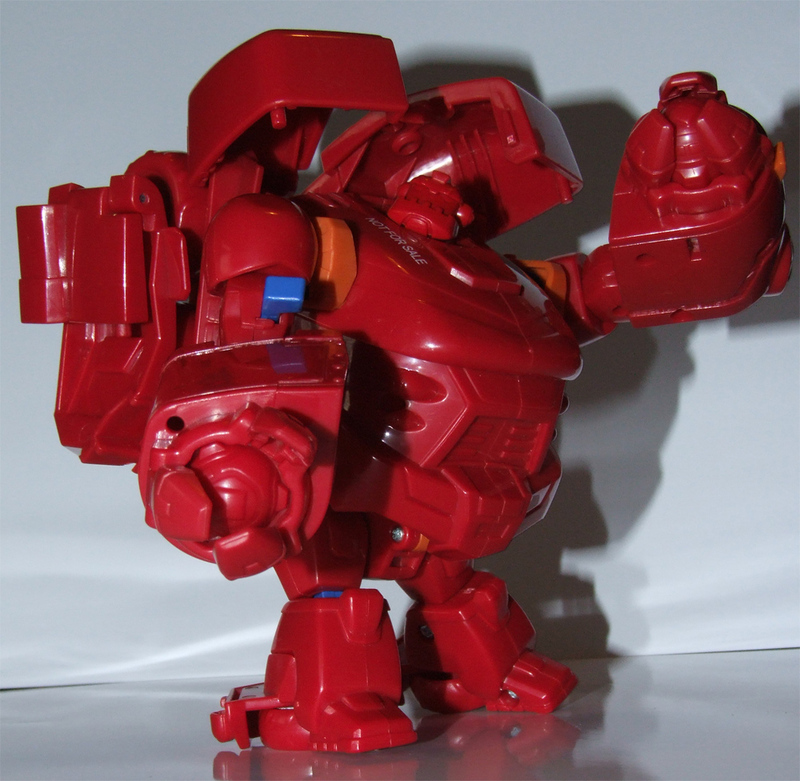 Overall, however, the figure is very nice, there is more articulation than I expected on the Bulkhead toy, it certainly looks show accurate from what we have seen of the series thus far, and bodes well for the other figures in the line.